Adult stem cells are responsible for life-long tissue maintenance. They reside in and interact with specialized tissue microenvironments (niches). Using murine hair follicle as a model, we show that when junctional perturbations in the niche disrupt barrier function, adjacent stem cells dramatically change their transcriptome independent of bacterial invasion and become capable of directly signaling to and recruiting immune cells. Additionally, these stem cells elevate cell cycle transcripts which reduce their quiescence threshold, enabling them to selectively proliferate within this microenvironment of immune distress cues. However, rather than mobilizing to fuel new tissue regeneration, these ectopically proliferative stem cells remain within their niche to contain the breach. Together, our findings expose a potential communication relay system that operates from the niche to the stem cells to the immune system and back. The repurposing of proliferation by these stem cells patch the breached barrier, stoke the immune response and restore niche integrity. Most, if not all, tissues of an adult animal contain stem cells. These stem cells regenerate and repair damaged tissues and organs for the entire lifetime of an animal, contributing to a healthy life. They divide to make daughter cells that become either new stem cells or specialized cells of that organ. Adult stem cells exist in specific areas within tissues known as niches, where they interact with surrounding cells and molecules that inform their behavior. For example, cells and molecules within these niches can signal stem cells to remain in a ‘dormant’ state, but upon injury, they can mobilize stem cells to form new tissue and repair the wound. So far, it has been unclear how stem cells sense damage and stress and direct their efforts away from their normal duties towards repair. Here, Lay et al. studied the stem cells in the mouse skin that are responsible to regenerate hair. Every hair follicle contains a niche (the ‘bulge’), where these stem cells live and share their environment with cells that anchor the hair. The niche tethers to the stem cells through specific adhesion molecules that also help the niche to form a tight seal to prevent bacteria from entering. Lay et al. removed one of the adhesion molecules called E-cadherin, which caused a breach in the niche’s barrier. The stem cells sensed their damaged niche, prepared to multiply, and sent out stress signals to the immune system. The immune cells then arrived at the niche and sent signals back to the stem cells, prodding them to multiply and patch the barrier, while at the same time, keeping the inflammation in check. This remarkable ability of the stem cells to recruit immune cells and initiate a dialogue with them enabled the stem cells to divert their attention from regenerating hair and instead directing it towards the site of the tissue damage. Other stem cells, such as those in the lung or gut, may have similar mechanisms to detect and respond to physical damage. It will be interesting to investigate the underlying mechanism of how immune cells are involved in balancing stem cell regenerative capacity and response to physical damage. A better knowledge of these processes could help to regenerate tissues or even entire organs. Adult stem cells reside in most if not all tissues. They are endowed with the ability to self-renew long-term and differentiate into specialized cell lineages in order to maintain, renew and repair tissues. In turn, stem cells are heavily influenced by the tissue microenvironment in which they reside. Together, the tight interaction and cooperativity between stem cells and their niche allow stem cells to perform their critical task of maintaining tissue homeostasis and function throughout the lifetime of the organism. To date, most studies on the niche have focused on the various factors it secretes to control stem cell behavior during normal homeostasis. These factors include both positive and negative signals emanating from a diverse array of niche cells, including stromal cells, blood vessels, nerves and stem cell progeny (Asada et al., 2017; Hsu et al., 2014a; Yu and Scadden, 2016). Far less is known about how stem cells cope with perturbations in niche integrity and orchestrate responses to restore niche homeostasis. For epithelial tissue stem cells, this is particularly important, as they must respond quickly to and repair a breach in their epithelial barrier that excludes harmful microbes and retains essential fluids. In the current study, we tackle this problem by taking advantage of the relatively simple architecture of the hair follicle (HF) bulge, the niche in which stem cells of the HF reside (Cotsarelis et al., 1990; Hsu et al., 2014a). The main part of the bulge is bilayered. It consists of a single concentric layer of stem cells that is sandwiched between a basement membrane on the outer side and a layer of terminally differentiated epithelial barrier ‘niche’ cells on the inner side. These ‘inner bulge’ niche cells are exposed to the external environment through an open channel that enables the hair to protrude from the skin surface (Figure 1A). The cells derive from the stem cells, but they do not do so directly within the bulge. Rather, the barrier cells are generated late in the terminal differentiation pathway of stem cell progeny that produce the new hair (Hsu et al., 2011). Adherens junctions in the niche but not its stem cells are affected by E-cadherin depletion. Images are from whole-mount immunofluorescence microscopy; DAPI (blue) marks chromatin. Antibodies are color-coded. (A) E-cadherin and P-cadherin expression (magnified views at right), summarized in drawings. Cb, club hair; Epi, epidermis; Inf, infundibulum; SG, sebaceous gland; Isth, isthmus; hair germ, hair germ; HFSCs, hair follicle stem cells. Scale bars, 30 μm. (B) Strategy of inducing Cdh1 ablation during the extended 2nd telogen and analyzing thereafter. Images show effective E-cadherin depletion in cKO bulge and isthmus by postnatal day 71 (P71). Scale bar, 30 μm. (C) Bulge expression of AJ proteins P-cadherin, p120-catenin, β-catenin and α-catenin. Shown are magnified views of bulge bilayer, with outer layer of stem cells (SC) and inner layer of ‘inner bulge’ (IB) niche cells (see Figure 1—figure supplement 2Afor zoomed out views). White arrows highlight the paucity of p120 at the Cdh1 cKO stem cell:niche interface. Scale bar, 10 μm. (D) Immunoblots of AJ proteins. Data are mean ±SEM of≥4 independent replicates of FACS-purified bulge HF stem cells normalized to GAPDH. ***p < 0.001; ****p < 0.0001. (E) Phalloidin staining reveals perturbations in F-actin within the inner bulge (IB), arising from Cdh1 ablation. Right, quantifications (n = 4 mice per condition/genotype; N = 20 HFs per mouse). Data are mean ±SEM. ***p < 0.001. (F) Whole-mount Z-stack imaging of tight junction components claudin one and zona occludens 1 (green). HF stem cells are co-labeled by CD34 (in red). Note paucity of tight junction labeling within the inner bulge (IB), arising from E-cadherin loss. (G) Barrier assay. Underlying dermis was removed from HFs and epidermis, which were then submerged in Lucifer yellow at 37°C for 3 hr, followed by fixation, mounting and imaging. Scale bar, 30 μm. Indeed, besides forming this epithelial barrier, the bulge stem cells also fuel the episodic bouts of hair follicle (HF) regeneration (‘anagen’) needed to replenish the protective hair coat of the animal. In between episodic cycles of hair growth, the bulge exists in a resting state (‘telogen’), anchoring the hair made in the previous hair cycle (Figure 1A). At the bulge base (‘hair germ’), quiescent stem cells interact with a specialized underlying mesenchymal structure, called the dermal papilla (DP). This cross-talk is necessary to yield a threshold of activating factors (BMP inhibitors, WNTs) that launch a new hair cycle (Hsu et al., 2011). Stem cells tether to their inner bulge niche through cadherins, the core transmembrane components of adherens junctions (AJs), which coordinate intercellular adhesion, junctional integrity and proliferation in epithelial tissues (Stepniak et al., 2009; Takeichi, 2014). AJs also stabilize tight junctions, which prevent passage of bacteria and other entities across an epithelial sheet (Rübsam et al., 2017; Tunggal et al., 2005). While bulge stem cells express both E- and P-cadherin, we discovered that the inner bulge niche expresses only E-cadherin. Here, we report that selective loss of E-cadherin within the inner bulge niche triggers a barrier breach that results in microbial invasion. We show that breached niche cells elevate an adhesive and cytoskeletal transcriptome. By contrast, the resident stem cells, which are normally quiescent, begin to proliferate in a fashion that we show is independent of microbial influence. Strikingly, they also activate a transcriptome that, when compared to proliferating anagen-phase stem cells in a normal niche, is similar in cell cycle genes, but differs in a cohort of immune-signaling genes. Moreover, although the cell cycle transcriptome lowers their threshold for quiescence, pushing them into proliferation requires this additional facet of the immune-signaling transcriptome. Indeed, the myriad of chemo-attractants, cytokines and growth factors induced by these stem cells when they experience a damaged niche is required to recruit immune cells into this otherwise purportedly ‘immune privileged’ site (Meyer et al., 2008; Paus and Bertolini, 2013). The outcome of this atypical two-pronged path to stem cell proliferation, namely enhanced immune signaling and cell cycling, is a repurposing of new daughter stem cells from their normal task of tissue regeneration and towards patching the breached barrier. Our findings have strong relevance to a breadth of human skin conditions where progenitor cell proliferation is coupled to barrier breach. Our data reveal that stem cells have the potential to sense defects in the integrity of their niche and respond by activating two branches of a transcriptional program, which together cope with the compromised tissue function surrounding them. Additionally and importantly, we show that the niche is not merely a source of secreted factors that control stem cell activity and tissue growth. Rather, it is a key structural entity whose integrity is closely monitored by its vigilant stem cell residents. We became interested in the possibility that cadherins may function critically in HF stem cell niche integrity when we analyzed bulge cadherin expression during the extended, synchronized telogen phase of the second hair cycle in mice (Figure 1A). 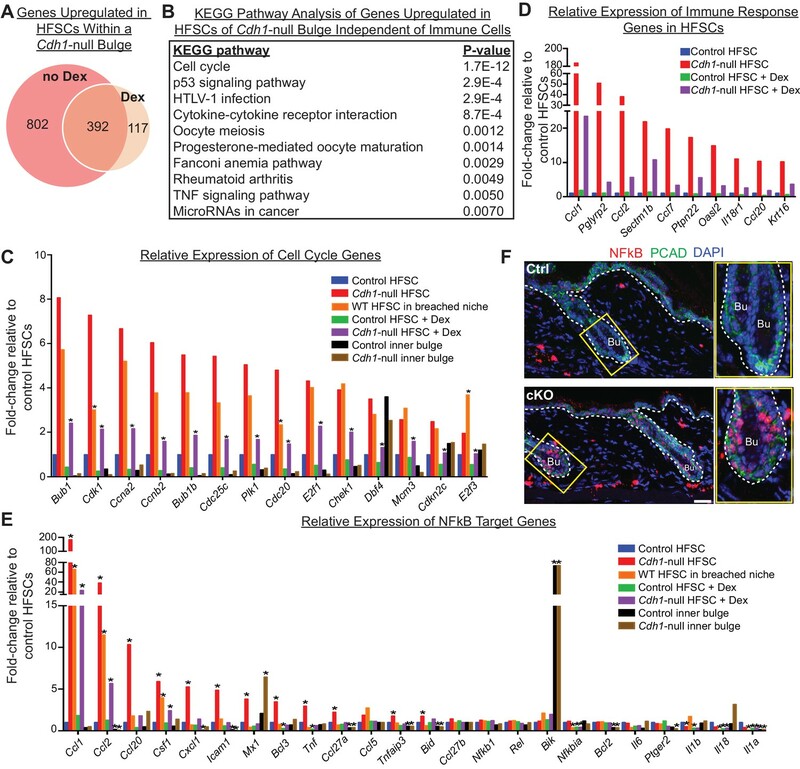 E-cadherin localized to most epithelial cell-cell boundaries, displaying the strongest immuno-labeling at the interface between niche cells and stem cells. Conversely, P-cadherin specifically concentrated at stem cell intercellular junctions and was absent from niche cells. This was consistent with the ~20X higher Cdh3 transcript level in the stem cells versus niche cells. Indeed, as judged by enzyme-linked immunosorbent assays (ELISAs) on protein lysates of bulge stem cells [purified by fluorescence-activated cell sorting (FACS) of skin cell suspensions], P-cadherin levels were even higher than E-cadherin (Figure 1—figure supplement 1A and B). As expected from our expression data and the functional redundancy of these cadherins (Tinkle et al., 2008), P-cadherin (Cdh3) null mice (Radice et al., 1997) displayed a normal hair coat and hair cycle (Figure 1—figure supplement 1C). E-cadherin was maintained at all cell-cell junctions within the P-cadherin depleted bulge, and hair germ cells became proliferative on cue during early anagen (Figure 1—figure supplement 1D). To explore the functional consequences of E-cadherin loss of function (loss of function) in the bulge, we conditionally ablated its gene (Cdh1) in Cdh1fl/fl; Rosa26lox-STOP-lox-YFP reporter mice by using a tamoxifen (TAM)-inducible CreER knocked into the endogenous locus of Sox9. By inducing Cdh1 ablation near the beginning of 2nd telogen (postnatal day P50), E-cadherin was efficiently depleted throughout the bulge when analyzed 3 weeks later (Figure 1B). Cdh1-null HF stem cells continued to display AJs along stem cell-stem cell borders, reflective of P-cadherin compensation (Figure 1C and Figure 1—figure supplement 2A and B). In fact, by immunoblot analyses and quantifications of proteins from FACS-purified α6+CD34+ HF stem cells, P-cadherin levels in E-cadherin deficient HF stem cells were even higher than normal (Figure 1D and Figure 1—figure supplement 2C), a feature confirmed by knocking down Cdh1 transcripts through shRNA (Figure 1—figure supplement 2D). By contrast, the Cdh1-null inner bulge layer lacked P-cadherin and in turn AJs on all cell-cell borders (Figure 1C). Since AJ formation requires intercellular cadherin-cadherin binding, this also left the stem cell-niche interface devoid of AJs. This was best exemplified by the paucity of p120-catenin at this interface (arrows in Figure 1C). Notably, p120-catenin binds directly to classical cadherins and is required for AJ stabilization. Immunoblot analyses confirmed the overall reduction in these other AJ proteins, despite upregulation of P-cadherin in stem cells within the Cdh1-depleted bulge (Figure 1D). AJs form an intercellular network of F-actin across an epithelial sheet of keratinocytes (Vaezi et al., 2002; Vasioukhin et al., 2000). In wild-type HFs, F-actin organization was particularly robust within the inner bulge, suggesting a special role for the cytoskeletal-intercellular networks within this layer of niche cells. However, in the absence of E-cadherin, the actin cytoskeletal organization was markedly perturbed throughout the inner bulge, including the stem cell-niche interface (Figure 1E). Probing deeper, we next examined tight junctions. As shown in Figure 1F and Figure 1—figure supplement 2E, the expression, localization, continuity and stability of tight junction proteins were largely intact in the CD34+ stem cells, but disrupted in the niche cells of the bulge. Moreover, when we tested for tight junction integrity by exposing HFs to Lucifer yellow, the dye penetrated the inner bulge layer deficient for E-cadherin (Figure 1G). Although our findings underscored the importance of E-cadherin in maintaining AJs, tight junctions and the integrity of the niche, niche cells were not lost from the bulge: desmosomes were still present in seemingly normal morphology, numbers and localization, and intercellular membranes at the niche-stem cell interface were still sealed (Figure 1—figure supplement 3A and B). The inner bulge layer also remain adhered to the club hair via ‘half-desmosomal’ structures as previously described for WT bulge (Hsu et al., 2011) (Figure 1—figure supplement 3C). As in the normal hair cycle, telogen-phase stem cells in Cdh1-heterozygous HFs were quiescent until anagen onset, when their proliferation initiated first within the hair germ (AnaI), and several days later within the bulge (AnaII-III; Figure 2A, first three panels) (Hsu et al., 2014b). Upon homozygous Cdh1 ablation, however, telogen-phase bulge stem cell residents began proliferating (Figure 2A, fourth panel; quantifications at right). In striking contrast to the normal hair cycle, this was neither preceded nor accompanied by hair germ proliferation. Telogen stem cells proliferate when E-cadherin is depleted from the bulge. Scale bars, 30 μm unless indicated otherwise. (A) (Left) Whole-mount immunofluorescence of HFs from mice pulsed with nucleotide analogue EdU for 24 hr prior to analysis. Proliferation dynamics are compared for control (Ctrl) HF, telogen (Tel) vs anagen (Ana) sub-stages I-III, and Cdh1 cKO HF in telogen. (Right) Quantifications of EdU+ CD34+ HF stem cells (n = 4 mice per condition/genotype; N = 20 HFs per mouse). Data are mean ±SEM. ****p < 0.0001. (B) Top: Following Cdh1 ablation in the bulge of 2nd telogen HFs, mice were shaved and monitored for hair coat recovery. Within 2 months, Ctrl mice had regenerated a new hair coat and entered their 3rd telogen, but Cdh1 cKO HFs were still in their 2nd telogen. Bottom: Telogen duration was determined as the period between week 8 of age (when TAM was administered) and the week during which 50% of shaved back skin had entered anagen (n = 4 mice per condition/genotype). Data are mean ± SEM. *p < 0.05; ***p < 0.001. (C) Skin histology, as examined by hematoxylin and eosin staining. Magnified views of boxed areas are shown, with black dashed lines denoting epithelial-dermal boundaries. Note hyperthickening of Cdh1 cKO bulge, compared to Ctrl. (D) Cdh1 bulge expansion derives from stem cells, as revealed by immunofluorescence for markers of stem cells (CD34+, SOX9+) vs inner bulge niche cells (K6+, SOX9+). Yellow-boxed regions are magnified at right of images. Quantifications of HF stem cell (HFSC) numbers at right (n = 4 mice per condition/genotype; N = 20 HFs per mouse). Data are mean ±SEM. ****p < 0.0001. (E–G) HF stem cell-specific ECAD loss of function was induced by activating Krt15CrePGR in 2nd telogen. HFs were analyzed by whole-mount immunofluorescence in 2nd or 4th telogen post-ablation (see Figure 2—figure supplement 1D for more details). (E) In 2nd telogen, ECAD is specifically depleted in HF stem cells (SC; boxed regions are magnified at the right). Following hair cycling, the inner bulge (IB) derives from HF stem cell progeny and hence is also Cdh1-null by 4th telogen. Hyperthickened bulge architecture correlates with ECAD loss of function in the niche cells of the inner bulge. (F–G) EdU labeling performed 24 hr prior to analyses shows that ECAD loss of function in HF stem cells alone does not elicit telogen-phase proliferation (F), while ECAD loss of function in both HF stem cells and inner bulge causes marked proliferative response (G). Data are mean ±SEM (n = 4 mice per condition/genotype; N = 20 HFs per mouse). (H) Inner bulge-specific ECAD loss of function was induced as indicated (see Figure 2—figure supplement 1E for more details). Note expansion in surrounding WT CD34+ stem cells, not seen in HF stem cell-specific ECAD loss of function. Normally, whether in homeostasis or in response to a wound, for example hair plucking, HF stem cell proliferation results in progeny that exit their niche and launch a new round of hair cycling (Hsu et al., 2011; Morris et al., 2004; Tumbar et al., 2004). By contrast, the daughters of proliferative events in the telogen Cdh1-null bulge remained within the niche (Figure 2A). Moreover, these HFs actually spent longer than normal in telogen prior to entering a new round of hair growth (Figure 2B). These results indicated that the normal telogen phase cues were still intact, which we later document further. Instead of being utilized to launch a new hair cycle, this telogen-phase stem cell proliferation produced additional bulge layers, readily evident by 5 weeks post-Cdh1 ablation (Figure 2C). Daughters retained stem cell identity as judged by bulge stem cell markers CD34 and LHX2, and by factors such as TCF4 and SOX9, which are expressed but not exclusively by HF stem cells (Figure 2D and Figure 2—figure supplement 1A). Quantifications revealed a significant expansion of stem cell numbers within the Cdh1-null bulge (Figure 2D). Despite the increased proliferation in telogen, Cdh1-null HF stem cells were still sensitive to the activating cues of the hair cycle, and returned to a non-dividing state as inhibitory levels rose in subsequent anagen and telogen (Figure 2—figure supplement 1B). This further suggested that the normal cues that govern hair cycling were still in place. We next addressed whether the bulge stem cells proliferated because of their own Cdh1 loss or that of the niche. Since changes in AJs can impact proliferation (Stepniak et al., 2009), we first considered whether the elevated P-cadherin seen in the Cdh1-null stem cells might be involved. However, when we engineered mice whose skin epithelium was selectively transduced with doxycycline (Doxy)-inducible Cdh3, we saw no significant effect on stem cell proliferation upon induction of P-cadherin over-expression (Figure 2—figure supplement 1C). Next, we used Krt15-CrePGR mice (Morris et al., 2004) to selectively ablate Cdh1 in bulge stem cells during the extended 2nd telogen (Figure 2E and Figure 2—figure supplement 1D). Strikingly, the ectopic stem cell proliferation and expansion of bulge layers that we had observed upon Cdh1 ablation in both stem cells and inner bulge, did not occur upon stem cell-specific ablation (Figure 2F). These data pointed to perturbations within the niche as the source of the stimulus for neighboring stem cells to proliferate. Since the inner bulge niche is derived from stem cell progeny that terminally differentiate towards the end of the hair cycle (Hsu et al., 2011), we could test our hypothesis by monitoring Krt15CrePGR-activated Cdh1 cKO mice through subsequent hair cycles, when E-cadherin was also lost in the niche (Figure 2E). Indeed, bulge stem cells proliferated and expanded concomitant with E-cadherin loss within the inner bulge (Figure 2G). Finally, by titrating down the TAM dosage administered to Sox9CreER; Cdh1fl/fl; Rosa26lox-STOP-lox-YFP mice, we restricted Cre activity to the inner bulge layer (Hsu et al., 2011) (Figure 2—figure supplement 1E). Notably, selective Cdh1 ablation in the inner bulge niche was sufficient to elicit an architectural shift to a triple layered bulge, even though the stem cells were now WT (Figure 2H). Together, these findings suggest that bulge stem cell proliferation may rely at least in part upon the direct interface between the stem cells and their defective inner bulge niche. The inability of the Cdh1 null inner bulge to retain dye (Figure 1G) suggested that its integrity is needed to provide a protective barrier to the external environment. Upon testing this possibility, we found that in contrast to controls, Cdh1 cKO HFs were infiltrated with microbes, as shown both by Gram-positive (deep violet) and Gram-negative (pink) bacterial stains and by fluorescence in situ hybridization (FISH) for a pan-bacterial 16S rRNA (Figure 3A and B). These findings highlighted the importance of a healthy inner bulge niche in guarding its stem cells and the skin against microbial infiltration. When the stem cell niche is breached, bacteria infiltrate but are not required for the stem cell response. (A) Gram staining of sagittal skin sections reveals near absence of bacteria in control HFs but presence of Gram-positive (deep violet; arrows) and Gram-negative (pink; arrowheads) bacteria in Cdh1 cKO HFs. Scale bars, 30 μm. Magnified images are of boxed areas (scale bars,10 μm). (B) Fluorescence in situ hybridization (FISH) of pan-bacterial 16S rRNA (white) in cleared skin whole-mounts, co-labeled for DAPI (blue). Spot analysis of 16S-FISH signal (yellow) was used to quantify bacterial load per 106 μm3 of skin. Negative controls included simultaneous FISH with scrambled probe on all samples (shown here in red from cKO), and analyses on germ-free mice (in bottom right frame). Antibiotics treatment of Sox9CreER; Cdh1fl/fl cKO mice depleted bacterial load to near control levels, as quantified at right. Scale bars, 30 μm. Data are mean ±SEM (n = 3 mice per condition/genotype). ****p < 0.0001; ns, non-significant. (C) Whole-mount immunofluorescence of telogen HFs from Cdh1 cKO and control mice treated with antibiotics. Note persistence of multiple layers of CD34+ proliferative stem cells within Cdh1 null HF bulge despite microbial depletion. Accompanying graphs quantify changes in niche architecture, EdU incorporation and HF stem cell (HFSC) numbers, presented as mean ±SEM (n = 3 mice per condition/genotype; N = 20 HFs per mouse). ***p < 0.001 ****p < 0.0001; ns, non-significant. Scale bar = 30 μm. Sox9CreER; Cdh1fl/fl cKO and control (without antibiotics) datasets are from Figure 2. A priori, the stem cells might be responding to these microbes that infiltrate the breached barrier, rather than the damaged niche per se. To test for the impact of these infiltrating bacteria, we treated mice with antibiotics to deplete bacteria from the skin. As judged by in situ hybridization for 16S ribosomal RNA, microbes were efficiently thwarted (Figure 3B). Despite efficient microbial clearing, the Cdh1 cKO bulge still remained proliferative and hyper-thickened (Figure 3C). Altogether, while our findings do not discount a role for bacterial signals, they rule them out as the instigating factor in causing stem cell proliferation when the niche barrier was breached. Upon barrier breach, a swarm of immune cells, positive for the pan-leukocyte marker CD45, selectively surrounded the bulge (Figure 4A). Although CD45+ numbers per unit area of skin varied, when we quantified the number of CD45+ cells within a 25 μm radius of the bulge, we consistently observed a marked and statistically significant increase in immune cells surrounding the Cdh1 null bulge as compared to the WT control bulge (Figure 4C, Cdh1-null bulge [Sox9CreER] vs control). A barrier breach within the stem cell niche results in immune cell recruitment. Scale bars, 30 μm. (A) Immunofluorescence (left) and flow cytometry quantifications (right; details below) of immune cells (CD45+) in Sox9CreER; Cdh1fl/fl cKO and control skins. (B) Sagittal skin sections were analyzed as indicated to determine the temporal relation between efficient E-cadherin depletion, recruitment of CD45+ immune cells and increase in 16S-FISH signals. Shown are quantifications of CD45+ immune cell numbers within a 25 μm radius from the bulge. Data are ±SEM (n = 4 mice per condition/genotype, N ≥ 10 HFs per mouse). ****p < 0.0001. (C) Quantifications of CD45+ immune cell numbers within a 25 μm radius from the bulge in sagittal skin sections from mice whose a) ECAD status within the bulge of telogen HFs, and b) status of antibiotic treatment, are shown. Data are ±SEM (n ≥ 3 mice per condition/genotype, N ≥ 10 HFs per mouse). In each case, significance testing was performed relative to control. ns, non-significant; ****p < 0.0001. Note that the swarm of CD45+ cells surrounding bulge is dependent upon ECAD loss of function in the niche not its stem cells. (D–F) Immunofluorescence and flow cytometry quantifications to characterize the CD45+ immune cell populations in Sox9CreER; Cdh1fl/fl cKO and control skins. Antibodies used were against: MHC Class II [dendritic cells (DCs), monocytes and macrophages (Macs)]; CD11c (DCs); CD11b and CD64 (Macs); CD3 (T cells); γδTCR [dendritic epidermal T cells (DETCs), some dermal T cells]; TCRβ (αβ T cells, including regulatory T cells [Tregs]); and FOXP3 (Tregs). Note accumulation of immune cells, particularly DCs and Tregs, specifically around the Cdh1-null HF bulge. Flow cytometry data are mean ±SEM (n = 4–6 mice per condition/genotype as indicated), confirming the significant differences (*p < 0.05; **p < 0.01, ***p < 0.001) in αβ TCR cells, Tregs and DCs between Ctrl and cKO (ns, non-significant). [Note that for Treg quantifications in F, the open-circle dataset included an outlier that was consistent with our findings, but which made the difference statistically insignificant. The triangle dataset excluded the outlier, in which case the difference between cKO and control was statistically significant.] See Figure 4—figure supplement 1A–E for more immunofluorescence images. See Figure 4—figure supplement 1F and G for flow cytometry strategies used to perform quantifications here and in (A). Given the microbial invasion, an immune response was expected. Yet surprisingly, we found that immune cells had already begun to accumulate by D23 post Cdh1 ablation, before the increase in 16S rRNA and shift to a triple layered bulge architecture which were robust only by D35 (Figures 2C and 4B). Moreover, when we depleted bacteria with antibiotics, immune cells were still recruited to the breached niche (Figure 4C and Figure 4—figure supplement 1A). By contrast, when we used Krt15CrePGR-activated mice to selectively ablate Cdh1 from 2nd telogen HF stem cells, immune cells were not recruited until subsequent hair cycles, when the inner bulge layer became Cdh1-null (Figure 4C and Figure 4—figure supplement 1B and C). A robust immune response also encircled the bulge when we ablated Cdh1 selectively in the inner bulge and not in stem cells (Figure 4C and Figure 4—figure supplement 1D). While many immune cells, including dendritic cells (DCs), macrophages, γδ dendritic epidermal T cells (DETCs), γδ TCR+ dermal T cells, and αβTCR+ dermal T cells, are known to be residents of the skin (Naik et al., 2015; Scharschmidt et al., 2017; Scharschmidt et al., 2015), this immune response arising from the breached niche went well beyond the normal surveillance status of the immune system. Moreover, the composition of the CD45+ immune cells that infiltrated the breached bulge showed clear differences from the normal resident immune cell patterns. Most notable was the increase in immunostaining for CD3+ T cells and CD11b+ myeloid lineage cells, including MHC-class II+ dendritic cells and F4/80+ macrophages (Figure 4D and E and Figure 4—figure supplement 1E). To further characterize, distinguish and quantify these cell types, we used these and additional markers to analyze immune cells by flow cytometry (Figure 4D–4F and Figure 4—figure supplement 1F and G). We observed a significant increase in the MHCII+ CD11c+ cells (Figure 4D) which are defined as dendritic cells since these cells are also negative/low for CD64, Mertk or Ly6C (Figure 4—figure supplement 1F). Additionally, although CD64+ Mertk+ macrophage numbers were more variable, and hence not statistically significant, they did follow a trend of being higher than normal, and preferentially associating with the breached niche (Figure 4D and Figure 4—figure supplement 1E). Focusing on T cells that were concentrated near breached bulge niches, γδ T cell and DETC numbers were comparable between WT and Cdh1 cKO skins, although DETC numbers were quite variable even among control samples (Figure 4E). By contrast, αβ T cells showed marked and statistically significant increases in Cdh1 cKO skins (Figure 4E). Many of these T cells were positive for FOXP3, a marker for regulatory T cells (Tregs), and further quantification revealed statistically significant increases in both absolute numbers and percentages of Tregs relative to the total αβ T cell population (Figure 4F and Figure 4—figure supplement 1G). Moreover, Treg numbers surrounding the bulge were markedly higher than the normal skin resident population (Figure 4F). Our data thus far indicated that the ability to elicit an immune response was independent of microbial presence, but dependent upon the barrier breach within the niche. A priori, this could mean that Cdh1-null inner bulge cells produce the chemokines that recruit the immune cells. Alternatively, upon detecting an AJ-deficient interface with the breached niche, stem cells, whether Cdh1-null or wild-type, might respond by producing and transmitting stress signals to the immune system. To distinguish between these possibilities, we FACS-purified and transcriptionally profiled inner bulge niche cells (Figure 5—figure supplement 1A) and stem cells (Figure 1—figure supplement 2C) from telogen-phase Cdh1 cKO and control littermate bulges. To tease out changes specific to stem cells residing in the breached niche, we also performed RNA-sequencing (RNA-seq) on WT bulge stem cells in anagen II/III, that is the only time when they naturally proliferate (Figure 5—figure supplement 1B). Our data were consistent across independent replicates, enabling us to generate molecular signatures of transcripts that were differentially expressed (p-value<0.05, absolute fold-change [FC]≥1.5) in either niche cells (1070↑, 1058↓) or stem cells (1194↑, 793↓) from Cdh1-null versus control bulges (Figure 5—figure supplement 1C). Scrutinizing the specific genes within each of the top four KEGG pathway categories of the Cdh1-null inner bulge profile, we found that transcripts encoding cell adhesion, proteoglycans and cytoskeletal-associated proteins were featured highly, consistent with a feedback attempt by these junction-compromised cells to restore the barrier, while metabolic pathways were downregulated (Figure 5A and Figure 5—figure supplement 1D). By contrast, cell cycle genes and immune signaling and response genes dominated the most highly changed pathways in the stem cells from Cdh1-null bulge niches (Figure 5B–5D, upper Venn diagram and Figure 5—figure supplement 1E and F). Moreover, in contrast to these proliferative stem cells within the telogen Cdh1-null niche, neither proliferative WT stem cells within an Ana II/III WT bulge nor quiescent WT stem cells within a telogen WT bulge showed expression of these immune pathway genes (Figure 5—figure supplement 1G). Principal Component Analyses further highlighted these marked distinctions between proliferative bulge stem cells devoted to normal tissue growth and those repurposed here to add cell layers to the damaged niche (Figure 5E). HF stem cells up-regulate chemokines to recruit immune cells. Stem cells or inner bulge niche cells were isolated from Sox9CreER cKO or matched littermate heterozygous control animals, that were either treated with low-dose Tamoxifen (Tamlow, to target only the inner bulge niche cells for Cdh1 loss-of-function) or regular-dose Tamoxifen (Tamreg, to target both inner bulge niche and stem cells). (A) KEGG pathway analyses of genes significantly up-regulated (p < 0.05, absolute fold-change ≥1.5) in Cdh1-null vs control inner bulge niche cells (both with normal stem cells). Shown are the top 10 of 30 pathways with p-values<0.05. (B) KEGG pathway analyses of genes significantly up-regulated (p < 0.05, absolute fold-change ≥1.5) in Cdh1-null vs control HF stem cells (HFSCs) from Cdh1-null or control bulge. Shown are the top 10 of 50 pathways with p-values<0.05. Overall, p-values are much lower for stem cells than inner bulge niche cells (A). (C) Fold-changes (FC) of significantly up-regulated genes in Cdh1-null stem cells from Cdh1-null bulge. Listed at right are top genes associated with immune response (FCs indicated in parentheses). (D) Top, Venn diagram comparing changed transcripts in WT stem cells that surround either a Cdh1-null mutant inner bulge niche (Tamlow) or a WT inner bulge niche (no Tam). Both populations commonly express 13208 genes (TPM [transcripts per kilobase million]≥1), but WT stem cells surrounding a mutant inner bulge gain expression of 1365 genes by ≥1.5 fold and lose expression of 1027 genes (TPM <1). 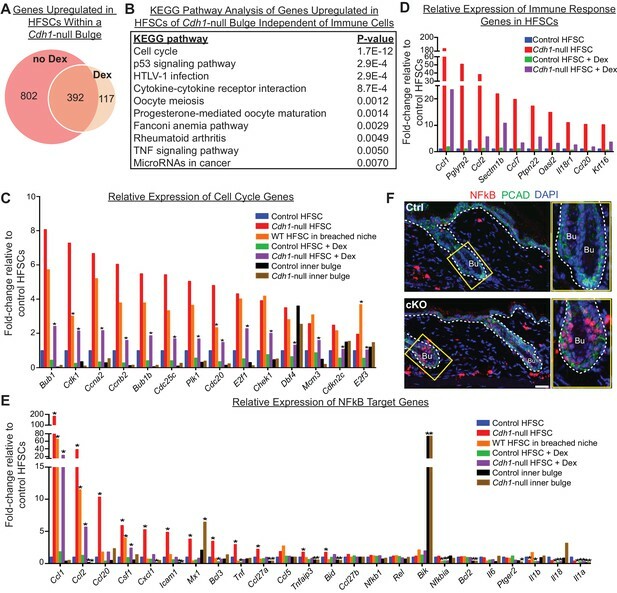 Bottom, Venn diagram comparing gene expression changes in stem cells vs inner bulge niche cells from Cdh1-null bulge. Note that the stem cells and their niche adopt highly distinct transcriptomes (upregulated genes shown here). (E) Principal component analysis (PCA) comparing transcriptomes of telogen-phase HF stem cells of WT, Cdh1 cKO and Het bulges, and of anagen II/III HF stem cells from WT bulges. (F, G) Relative expression of genes within the KEGG pathway term ‘cytokine-cytokine receptor interaction’ and genes associated with immune response that scored as significantly up-regulated (Cdh1-null vs control) for niche (F) or stem cells (G). Note that of the few immune signaling genes in the breached niche signature, most are more highly and significantly expressed by the stem cells (*) (F); conversely, many immune response genes in the stem cell signature are barely expressed, if at all, in the breached inner bulge niche (G). Navy and red bars correspond to data from Tamreg mice; orange, black and brown bars correspond to data from Tamlow mice. (H) Two highly upregulated immune response stem cell genes, Ccl1 and Ccl2, are still as highly expressed even after antibiotics treatment, underscoring their independence from bacterial infiltration. qRT-PCR data are normalized to Ppib. Data are mean ±SEM (n = 4 mice per condition/genotype). ns, non-significant. All data were from Tamreg mice. (I, J) Transwell migration assays. Cdh1-null and Ctrl HF stem cells were seeded in bottom Boyden chamber. Bone marrow-derived dendritic cells (BMDCs) or macrophages (BMDM), either WT or deficient for CCR2 receptor, were placed in upper chamber, with or without isotype control or CCR8 blocking antibody. CD45+ BMDCs and BMDM that were chemo-attracted to bottom chambers were quantified by flow cytometry. Data are mean ±SEM (n = 3). Comparisons that are statistically significant are denoted by asterisks. *p < 0.05; **p < 0.01; ***p < 0.001; ****p < 0.0001. Our analyses also revealed salient differences in the transcriptional responses of niche versus stem cells within the damaged bulge (Figure 5D, bottom Venn diagram). This was true even for categories with some apparent overlap, such as cytokine:cytokine receptor interaction transcripts (Figure 5A and B). Indeed, closer inspection of individual genes within this and related immune cell categories of the niche transcriptome revealed that levels of these niche transcripts were often considerably lower and less significant than in their stem cell neighbors (Figure 5F). By contrast, of the cytokine and chemokine genes that were highly changed in the stem cell transcriptome (Figure 5C), most were substantially more highly expressed by these stem cells than their Cdh1-null niche neighbors, even when the stem cells surrounding a Cdh1-null inner bulge niche were wild-type (Figure 5G). Ccl1 and Ccl2 were the top two most highly upregulated genes in this stem cell cohort (184X, 38X; Figure 5C), and like most of this transcriptome, were barely expressed by the neighboring breached niche. Notably, CCL1 and CCL2 are established chemokines for both DCs and macrophages (Cantor and Haskins, 2007; Gombert et al., 2005; Li and Tai, 2013; Moser et al., 2004). Importantly, not only were Ccl1, Ccl2 and many other features of these signatures robustly expressed by the HF stem cells experiencing a breached niche, but this response still occurred even when microbial infiltration was repressed (Figure 5H). This suggested that the stem cells recruited immune cells in direct response to the damaged niche rather than the bacteria that infiltrated. Since CCL2 is an established chemokine for the CCR2 receptor, expressed by both DCs and macrophages, we focused first on the potential interactions between stem cells and these immune cells. To mimic the damaged niche microenvironment in vitro, we used Cdh1-null HF stem cells, which retained elevated Ccl2 in culture (Figure 5—figure supplement 1H). We then tested their ability against WT HF stem cells to recruit bone marrow-derived DCs and macrophages in transwell migration assays. As shown in Figure 5I, a significant increase occurred in chemotaxis of bone marrow-derived DCs. Moreover, this difference was abolished when we used DCs that lacked CCR2. On the other hand, while the migration of macrophages in response to Cdh1-null HF stem cells followed a similar trend, the difference was highly variable and thus not statistically significant. Strikingly, these in vitro patterns of DC and macrophage migration were consistent with our in vivo immune cell profiling (Figure 4D), and revealed that Cdh1-null but not WT stem cells can directly attract DCs, and to a lesser extent macrophages, through a CCL2-CCR2-dependent mechanism. Conversely, CCL1 stimulates CCR8 receptors, which are on the surface of DCs and macrophages. To test the significance of HF stem cell CCL1, we repeated the cell migration assays as above, this time using a CCR8 blocking antibody to disrupt a potential CCL1-CCR8 interaction. Interestingly, while the reduction in chemotactic response of DCs and macrophages was not as robust as blocking the CCL2-CCR2 axis (Figure 5J), treatment of CCR2-null DCs or macrophages with CCR8 blocking antibody to simultaneously block both CCL1 and CCL2-mediated chemotaxis further reduced their migration to statistically significant levels (Figure 5I). These findings were important as they indicated that HF stem cells experiencing a barrier breach in their niche can activate chemokines and directly recruit the immune cells that we see elevated upon a barrier breach. Why DC recruitment in vivo appeared to be more consistent than macrophage recruitment is not clear. However, it is notable that DCs and macrophages respond to similar chemokines during recruitment, and depending upon the particular cytokine milieu, differentiation of inflammatory monocytes can be skewed to DCs or macrophages (Geissmann et al., 2010). We next addressed whether immune cells are required to trigger the stem cell proliferation that generated a thickened bulge. We waited until D18 post-Tam treatment, when Cdh1 was ablated, but immune cells had not yet been recruited to the bulge (Figure 4B). We then administered the immunosuppressant dexamethasone (Dex) daily for ~2.5 weeks, and analyzed mice. At this time, untreated counterparts were swarmed by CD45+ immune cells and the bulge was hyperthickened (Figure 6A). Stem cell proliferation and bulge hyperthickening arise from immune cell stimulation. Scale bars, 30 μm unless indicated otherwise. (A) Dexamethasone suppressed infiltration of immune cells to the bulge when administered after ECAD loss of function but prior to the immune response,. (B) As shown by CD34+, EdU incorporation and pSMAD1 whole-mount immunofluorescence, telogen-phase Cdh1-null bulge stem cells maintain quiescence in Dex-treated mice. Note that only when stem cell-stimulatory signals override BMP signals coming from the niche is pSMAD1 lost. Accompanying graphs quantify changes in niche architecture, HF stem cell (HFSC) proliferation and stem cell number, presented as mean ±SEM (n = 4 mice per condition/genotype; N = 20 HFs per mouse). ns, non-significant; *p < 0.05; ****p < 0.0001. Graph at right shows that Dex does not significantly impact HF stem cell proliferation in vitro; data are mean ±SEM (n = 3). (C) Upon Dex treatment, the influx of DCs and Tregs to the breached stem cell niche is blocked. Note that resident immune cells still show similar patterns. Note also the close proximity of DCs and Tregs in the cKO bulge region (magnified in top middle panel). (D) Tregs directly impact stem cell proliferation, as shown by in vitro co-culture assays of FACS-purified Cdh1 cKO HF stem cells with BMDCs, conventional T cells (Tconv) or FACS-purified Tregs, prepared and tested as described in the methods. Experiments were performed in triplicate. In contrast to Tconv and DCs, the effects of Tregs were substantial (p < 0.05). Data are mean ±SEM. ns, non-significant; *p < 0.05. While not eliminating the resident skin immune cells, Dex effectively blocked the immune infiltration that otherwise surrounded the breached niche barrier in Cdh1 cKO HFs (Figure 6A). Significantly, Dex-treated Cdh1 cKO HFs also displayed normal bulge architecture (Figure 6B). Accordingly, both the telogen-phase proliferation displayed by stem cells in their deficient niche, and the concomitant increase in stem cell numbers, were now abolished. This was further reflected by the enhanced BMP-signaling effector phosphorylated-SMAD1 (Figure 6B), which in normal stem cells only diminishes in Anagen II/III when the natural activating cues override BMP quiescence signals from the inner bulge niche (Hsu et al., 2014b). That said, even in the absence of Dex, there were still signs that the normal telogen signals were intact in the Cdh1-null bulge. Thus, inner bulge-derived BMP6, a prerequisite for these pSMAD1 signaling dynamics, was still expressed by the Cdh1-null inner bulge cells, and correspondingly, the HF stem cells experiencing the breached niche still expressed BMP target genes, including Nfatc1 and Foxc1 (Figure 6—figure supplement 1A). Since ablating only one immune component can have a profound effect on the remaining immune cell repertoire, it was necessary to use total immune cell suppression, rather than genetic ablation of specific immune cell populations. Although Dex impacts full-anagen phase HFs by inducing their early entry into the destructive phase (Kwack et al., 2017), our study focused on telogen, where no adverse effects of Dex had been reported. However, it was important to assess whether it was suppression of the immune response or Dex itself that was impacting stem cell proliferation. As shown in the growth curves in Figure 6B, Dex alone did not inhibit HF stem cell proliferation directly. Moreover, bacteria were still present in immunosuppressed skin, arguing against their involvement in the proliferation dynamics observed here (Figure 6—figure supplement 1B). This finding also added to the evidence that the microbial infiltration arose from the loss of junctional integrity within the Cdh1-null niche, and not from the associated architectural disturbances caused by stem cell proliferation in the Cdh1-null niche. Given these collective results, we focused on immune cell infiltration as the root of stem cell proliferation and expanded bulge structure. Thus far, our immune analyses indicated that DCs and Tregs were elevated prominently and specifically around the breached barrier (Figure 4). Closer inspection revealed that DCs and Tregs were closely associated with each other when surrounding the breached niche, and Dex treatment markedly blocked their infiltration into the Cdh1-null bulge niche (Figure 6C). Moreover, the immunosuppressive effects of Dex appeared to be specific for the immune infiltration to the bulge, as immune cells elsewhere in the skin remained during the Dex treatment (Figure 6C). In this regard, the Dex-treated Cdh1-cKO pattern of CD3+ and MHCII+ immune cells resembled that of untreated control skin (Figure 6—figure supplement 1C). Since Dex blocked immune infiltration into the breached niche, and since immune infiltration was essential for the specific proliferation of bulge stem cells that we observed, we turned to in vitro studies to address whether DCs or Tregs might directly affect HF stem cell proliferation. For this purpose, we purified and activated DCs as before (Figure 5I and J), and employed established protocols (see Materials and methods) to stimulate freshly isolated splenic naïve CD4+ T cells with CD3/CD28 antibodies (conventional T cells; Tconv). For Treg induction, we also added TGFβ (Fantini et al., 2007). By compartmentalizing the immune cells, we then assessed the effects of their secreted factors on the proliferation of HF stem cells. As shown in Figure 6D, while DCs showed no appreciable effect on HF stem cells, Tregs appeared to be particularly robust in soliciting a proliferative response. In wild-type skin, resident Tregs, which are positive for NOTCH ligand JAG1, have been proposed to promote HF stem cell proliferation through direct engagement and activation of Notch target genes (Ali et al., 2017). If so, we might have expected to see an elevation of Notch target genes in the stem cells of the Cdh1 null bulge, given the marked elevation of Tregs within close proximity. That said, the most striking canonical NOTCH target gene showing sensitivity to dexamethasone was Hey1, and in this case, transcripts were up, rather than down when the Treg swarm was diminished (Figure 6—figure supplement 2A). We also examined the status of a cohort of HF stem cell genes reported to bind activated NOTCH in a ChIP-seq analysis of a muscle cell line (Castel et al., 2013) (Figure 6—figure supplement 2B). Indeed, most of these and established NOTCH target genes were very lowly expressed in normal telogen phase HF stem cells, consistent with the well-documented role for NOTCH signaling in HF differentiation, rather than bulge stem cell proliferation (Demehri and Kopan, 2009). Importantly, NOTCH target genes were not elevated appreciably in HF stem cells when the niche barrier was altered and swarmed with Tregs. Rather, we surmise that Tregs’ proliferative effects that we observed on HF stem cells here are more likely to be rooted in amphiregulin and/or keratinocyte growth factor, known to be robustly expressed by Tregs in an inflammatory setting (Arpaia et al., 2015; Dial et al., 2017). Similarly, in some contexts, the tension sensor YAP, is retained by α-catenin in the cytoplasm and becomes nuclear upon a loss of adherens junctions (Li et al., 2016; Neto et al., 2018; Schlegelmilch et al., 2011), leading to a marked increase in target genes of the YAP/TEAD transcription factor complex (Liu and Wang, 2015; Zanconato et al., 2015; Zhang et al., 2011). Since the telogen-phase HF stem cells in a Cdh1-mutant niche were proliferative, and YAP is known to influence proliferation, the elevation in Ccne1 and other YAP target genes governing proliferation seemed at first glance to suggest altered YAP activity. However, Dex treatment largely normalized these cell cycle-related differences, and most other YAP target genes showed no major changes in expression irrespective of immune suppression (Figure 6—figure supplement 2C). In the absence of expression changes attributable to Cdh1 status, and given the multiple alternative and possibly confounding means by which YAP is known to be regulated (Deng et al., 2018; Totaro et al., 2018), we did not pursue this further. Finally, to identify the portion of the stem cell transcriptome signature that is independent of immune cell infiltration, we performed RNA-seq on stem cells isolated from Dex-treated Cdh1-null and control bulges of telogen-phase HFs and compared their transcriptomes to their non-treated counterparts. A total of 509 genes were found to be significantly upregulated in stem cells from Dex-treated Cdh1-null versus control niches. Of these, 392 genes (77%) were also upregulated in their non-treated counterparts (Figure 7A). Stem cell transcriptomic changes occur in direct response to a barrier breach. (A, B) Comparisons of transcriptomes of HF stem cells (HFSCs) from Cdh1 cKO vs.Ctrl bulges ±Dex. Venn Diagram (A) showed 392 overlapping genes that were significantly up-regulated (p < 0.05, fold-change [FC]≥1.5, 509 genes total) independent of Dex. (B) KEGG pathway analysis of these genes. (C) Relative expression of ‘Cell cycle’ genes from (B) in various HF stem cell and inner bulge populations. These genes are also significantly upregulated (p < 0.05) in WT SCs in a breached niche vs. control SCs. *p < 0.05 relative to Cdh1-null HFSCs. (D) Relative expression of immune response genes in stem cells from Cdh1-null bulge vs. Ctrl bulge in the absence or presence of Dex treatment. (E) Relative expression of NFkB target genes in various HF stem cell and inner bulge populations. *p < 0.05 (with absolute FC ≥1.5) relative to control HF stem cells. (F) Immunofluorescence for phosphorylated p65, a subunit of the NFkB transcription factor. Note increased nuclear p-p65 signal in Cdh1-cKO bulge (Bu) indicative of NFkB signaling activity. Despite stem cells being un-proliferative under Dex treatment, the top KEGG pathway enriched among these 392 overlapping genes was still cell cycle (Figure 7B). Although the expression of these cell cycle transcripts was dampened by immunosuppressive conditions (Figure 7C, purple vs. red bars), they were still significantly upregulated, independent of both Dex treatment (Figure 7C, purple vs. green bars) and Cdh1 loss (Figure 7C, orange vs. blue bars). A similar trend was observed for many of the immune response genes, whose expression persisted in HF stem cells in a breached niche even under immunosuppressive conditions (Figure 7D). Taken together, our findings suggested that the necessary threshold level of cell cycle transcripts required to push telogen-phase stem cells into proliferation was contributed in part by the Cdh1-null niche and in part by the ability of these stem cells to recruit immune cells. Seeking why telogen-phase proliferation of stem cells was dependent upon not only immune cells but also niche status, we were drawn once again to the reduction in adherens junction proteins that stem cells experienced when they resided in the Cdh1-null bulge niche (Figure 1C and D). An inverse correlation between adherens junctions and cell proliferation is well-established (Stepniak et al., 2009), and our findings here pointed to a potential link at the transcriptional level. 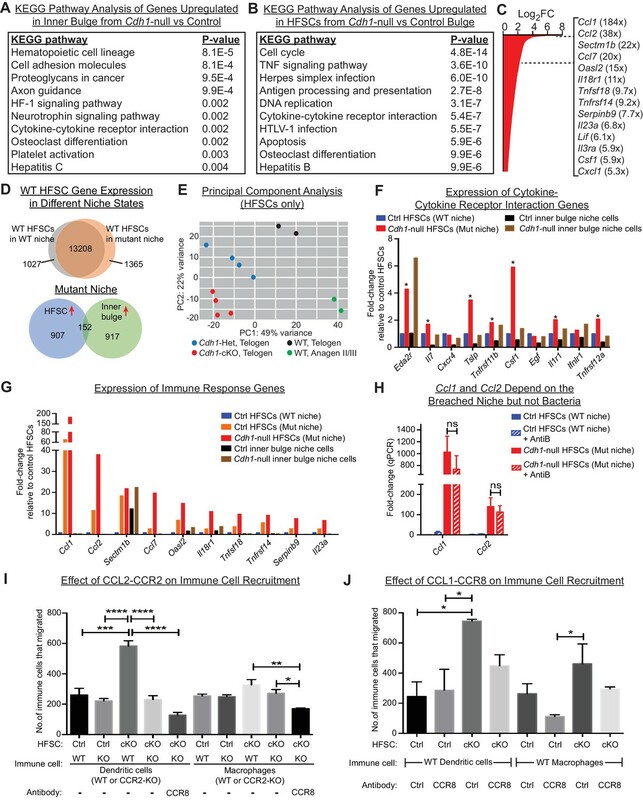 Of additional note, many of the immune response transcripts that remained elevated in the HF stem cells of Dex-treated cKO skin were putative NFkB target genes, including Tnfa, Ccl2, Ccl1, Csf1, Cxcl1 and Ccl20 (Figure 7E). Previously, we showed that when p120-catenin (Ctnnd1) is conditionally ablated in skin epithelia, IkB kinase (IKK) activity is elevated, resulting in the phosphorylation of IkBα and the release of the transcription factor NFkB into the nucleus (Perez-Moreno et al., 2006). Intriguingly, by immunofluorescence, NFkB showed nuclear localization in telogen-phase Cdh1-null HF stem cells (Figure 7F), which also had reduced p120 levels (Figure 1C and D). Although dexamethasone has been reported to dampen NFkB signaling by elevating IkBα transcription (Auphan et al., 1995; Scheinman et al., 1995), it only had a partial effect in Cdh1-null HF stem cells under conditions where IkBα phosphorylation was enhanced (Figure 7E). While further details are beyond the scope of the present study, our results suggest a mechanism whereby when the barrier is breached, reductions in adherens junctions impacts the activity of transcription factors such as NFkB, that can directly alter the transcriptional landscape of the HF stem cells in a way that promotes immune cell recruitment, and reduces, but does not overcome, the threshold for proliferation (Figure 8 and Figure 6—figure supplement 2D). Model Summarizing How Stem Cells Respond to a Breach in Their Niche Barrier and Launch a Patch Process by Repurposing Stem Cell Proliferation. During telogen, inner bulge niche cells express BMP6 and FGF18, which maintain stem cell quiescence. When the sole cadherin (ECAD) of the inner bulge is removed, the niche cannot make adherens junctions (AJs), leading to tight junction destabilization, a barrier breach and microbial infiltration. Even though stem cells have compensatory PCAD and maintain stem cell-stem cell AJs, they cannot form AJs along the niche-stem cell interface. This reduction in AJ components induces a cell cycle transcriptome which lowers the threshold for proliferation, but is kept in check by niche inhibitory signals. Within their breached niche, stem cells also induce a transcriptome geared towards recruiting immune cells to the bulge, independent of the increased bacterial load. The stem cells need this altered microenvironment to tip their proliferative balance. Without anagen cues, newly generated stem cells remain within the bulge, where they are repurposed to boost the output of distress signals to the immune system and contain the breached barrier by reinforcing the bulge with layers of immune cells and stem cells that display intact cellular junctions. The most important function of the skin epithelium is to provide the barrier that excludes harmful microbes and retains body fluids. When the barrier is breached, it must be repaired expeditiously to restore fitness to the animal. HFs extend deep into the skin, leaving an entry site for pathogens. The bulge niche of HF stem cells is strategically positioned at the base of this orifice that opens to the external environment. In our current study, we show that in addition to its role as a source of inhibitory signals for its stem cells (Hsu et al., 2011), the inner bulge provides the barrier that protects stem cells from microbial invasion. In exploring how stem cells cope when their barrier is breached, we learned that by co-expressing P- and E-cadherin, the stem cells themselves are protected from the many situations where E-cadherin levels are naturally downregulated, which includes stem cell activation at the start of the hair cycle (Lay et al., 2016). Our new data substantiates this further, as when E-cadherin is lost from HF stem cells, they markedly upregulate P-cadherin. Through their immediate proximity to the inner bulge layer, the HF stem cells are poised to sense a barrier breach. Remarkably, our studies revealed that neither bacteria nor immune cells were required for this sensing to occur. 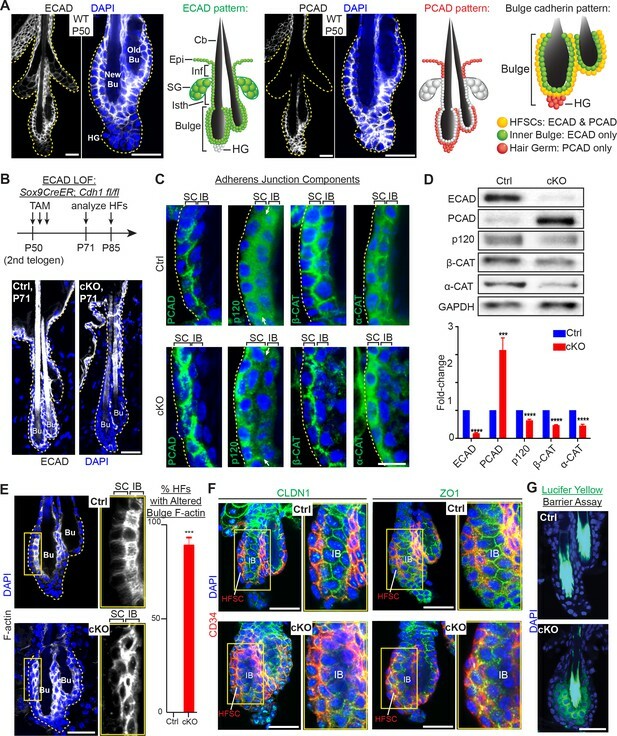 Although the precise details await further investigation, the roots are likely to reside in the inability of stem cells to form adherens junctions with their Cdh1-null niche neighbors, which lack a cadherin backup system. As our data revealed, intercellular cadherin-cadherin junctions are featured prominently at the stem cell-niche interface of healthy HF bulges. Such junctions are known to act as key signaling centers and integrators of proliferation, polarity and the actin cytoskeleton across an epithelial tissue (Padmanabhan et al., 2015; Stepniak et al., 2009), and our current findings add to the mounting evidence that these junctions also serve as key regulators of inflammatory sensors (Perez-Moreno et al., 2006). As we learned, once stem cells face a breach in their niche barrier, they trigger a distress transcriptional program that we show occurs even in the face of antibiotics or immune suppressive drugs and is strikingly different from the response elicited in the neighboring niche cells. Our findings are interesting in light of prior studies showing that under a number of different conditions, keratinocytes can express cytokines and chemokines that harbor potential to communicate with the immune system in normal homeostasis and in injury (Adachi et al., 2015; Ali et al., 2017; Chen et al., 2015; Pasparakis et al., 2002; Zhang et al., 2004). Of additional relevance to our study are previous observations that hair plucking enhances hair cycling, an effect which has been postulated on the one hand to be triggered by the loss of the BMP-expressing inner bulge niche cells (Hsu et al., 2011) but on the other hand to an elevation of Ccl2 and inflammatory macrophages in the skin (Chen et al., 2015). 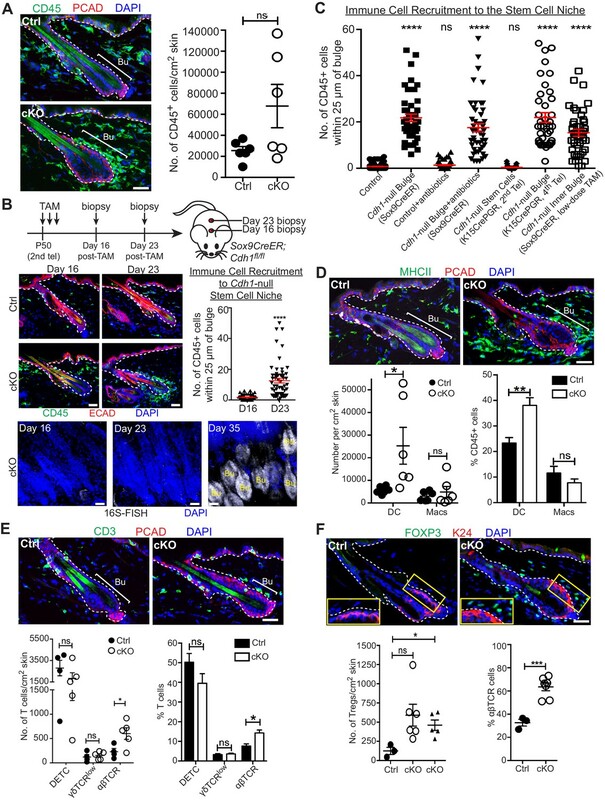 While intriguing, none of these prior studies have revealed whether stem cells are specifically capable of altering their transcriptional program in response to perturbations in their microenvironment and if they can, whether this endows them with the ability to adjust their behavior by directly recruiting immune cells. Notably, Ccl2 was also at the top of our changed genes, along with related Ccl1, underscoring their sensitivity to skin perturbations, and tracing their expression to stem cells. However, in our system, when the entire immune repertoire was analyzed and quantified relative to bulge proximity, DCs were among the most consistently changed early immune respondents. Like M1 macrophages, DCs have surface receptors that respond to CCL1/2 (Gombert et al., 2005; Moser et al., 2004). Moreover, by in vitro co-culture and genetic targeting of the corresponding DC-CCL receptors, we showed that DCs use this crosstalk with HF stem cells to specifically congregate around the bulge. In this case, however, recruitment of DCs and (more variably) macrophages did not trigger a new hair cycle, pointing to a major difference between disrupting the barrier function of the BMP6-expressing inner niche layer and removing this layer altogether as in hair plucking which does initiate a new hair cycle. During normal epithelial homeostasis, resident DCs can dialogue with Tregs (Leventhal et al., 2016; Seneschal et al., 2012), and thus may also be capable on their own to shape the adaptive immune response that swarmed the damaged niche. Although our co-localization data and accumulation of Tregs with DCs around the bulge are supportive of this mechanism, our transcriptomics revealed that independently of immune cells, stem cells within a damaged niche are also well-equipped with a complex arsenal of cytokines and chemokines to communicate with both the adaptive and innate immune systems. Such chemokines include CCL1 (Hoelzinger et al., 2010; Scharschmidt et al., 2017) and CCL20, which are both potent stimuli for Tregs. Recently, it was shown that in normal homeostasis, Tregs come into close proximity of the bulge towards the telogen to anagen transition, where in addition to BMP-inhibitors, WNTs and other activating cues, they help to fuel hair regeneration (Ali et al., 2017). Although Treg ablation studies suggested a role for Tregs in hair cycling, it has remained unknown whether such effects are direct or indirect. Our findings here showed that proliferative effects of Tregs on HF stem cells can be direct. It is curious that in homeostasis (Ali et al., 2017) and hair plucking (Chen et al., 2015), stem cells are stimulated to proliferate and launch new hair growth, while in the face of a barrier breach, stem cells direct their efforts towards containing the damage. Based upon the evidence at hand, this difference likely resides in the plethora of growth factors, cytokines, reactive oxygen species, and lipid mediators that are generated by immune cells under different conditions (Demehri et al., 2008; Yoon et al., 2016). Although the precise nature of this complex communication between the stem cells and immune cells is beyond the scope of the current study, we have shown that it is considerably more robust and diverse than that which functions in normal hair cycling or transient injury response. That said, the collective evidence points to an important role for stem cells in sensing and responding to their local environment. Their ability to subsequently recruit distinct immune cell repertoires enables stem cells to receive new sets of instructions that deviate from their normal homeostatic state, thereby channeling their efforts in new directions. This intricate feedback mechanism enables the recruited immune cells to repurpose stem cells from their normal job of making hair to instead participate in curbing the breached barrier. This diversion of HF stem cells away from their normal regenerative function had two important outcomes. First, it added a new layer of AJ-competent cells to line/reinforce the damaged bulge. Second, because the activated stem cells transcribed an array of immune signaling genes, their amplification within the niche bolstered the local production of distress signals. Altogether, this captivating communication network appeared to be aimed at patching the breached barrier and limiting tissue damage that would otherwise be caused by chronic inflammation. Indeed, the ensuing immune cell-associated ‘hyperthickening’ phenotype was locally restricted to the site of the barrier breach (Figure 8 and Figure 6—figure supplement 2D). Since our breached HF barrier model was a genetic one, it was not surprising that the efforts of the HF stem cells to patch the barrier were futile, as evidenced by the bacterial infiltration seen in the Cdh1-null HFs and their surrounding tissue (Figure 3). Indeed, there are a number of genetic disorders involving breached skin barriers in which stem cells hyper-proliferate and yet are unable to repair the barrier. In this regard, it is intriguing to consider epidermolytic hyperkeratosis patients and mice, which harbor suprabasal epidermal keratin one and/or keratin 10 mutations. In this case, the healthy epidermal stem cells respond to the barrier breach, but they maintain a single layer of proliferative progenitors, while dramatically expanding the (defective) layers of terminally differentiating cells (Fuchs et al., 1992). By contrast, the proliferative Cdh1 null HF stem cells cannot directly generate the terminally differentiated barrier cells (Hsu et al., 2011), and instead generate multiple layers of stem cells. While neither of these responses are successful, they likely reflect a general, evolutionarily conserved mechanism intrinsic within epithelial stem cells to respond to and repair barrier defects wherever they emerge. Studies in Drosophila testis and ovary have long established a role for E-cadherin in adhering germline stem cells to their niche, a process critical to balancing stem cell self-renewal and differentiation (Song et al., 2002; Yamashita et al., 2003). 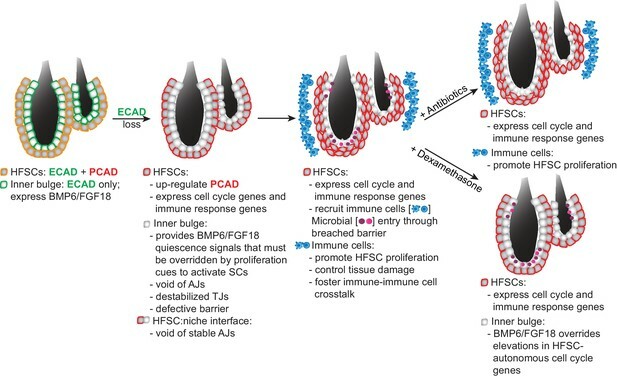 Although the roles of AJs in mammalian stem cell niches have not been studied extensively, the increased HF stem cell proliferation could reflect a direct response to the reduced AJ levels that appeared to emanate from the perturbed inner bulge:stem cell interface. Thus it was surprising that immune suppression kept the ectopic proliferation of telogen HF stem cells largely in check. These findings expose an additional layer of complexity in the proliferative control of HF stem cells not seen in the invertebrate stem cell systems studied to date. Previous reports have described immune, hyperproliferative responses of mammalian epithelial tissues following genetic perturbations in various AJ components (Perez-Moreno et al., 2006; Vasioukhin et al., 2001). However, the responses documented occur directly at the level of genetic alterations and are thus largely cell-autonomous. The specific roles for α-catenin and p120-catenin in signaling also appear to be independent of barrier function. Notably, as we have shown here, the stem cells displaying a hyperproliferative response can themselves be wild-type and depend upon their border with damaged niche neighbors to trigger the subsequent cascade of events we identified. Despite the critical role that the immune response plays to induce stem cell proliferation, the telogen-phase stem cells within the damaged niche still maintained in part a transcriptome reflective of cell proliferation even when the immune response was repressed. This aspect of their transcriptome paralleled that of their natural proliferative state in the hair cycle. However, in early anagen, the levels of hair cycle stimulatory factors outweigh the quiescence factors emanating from the bulge niche. By contrast, within a damaged telogen-phase niche, the quiescence factors still remained high, and in the absence of anagen-stimulating factors, the reduction in AJs and elevation in cell cycle transcriptome were not sufficient on their own to activate these stem cells. In this way, the proliferative trigger for repurposing the stem cells became contingent upon the unleashing of immune distress signals upon the failure of their niche neighbors to provide a proper barrier. 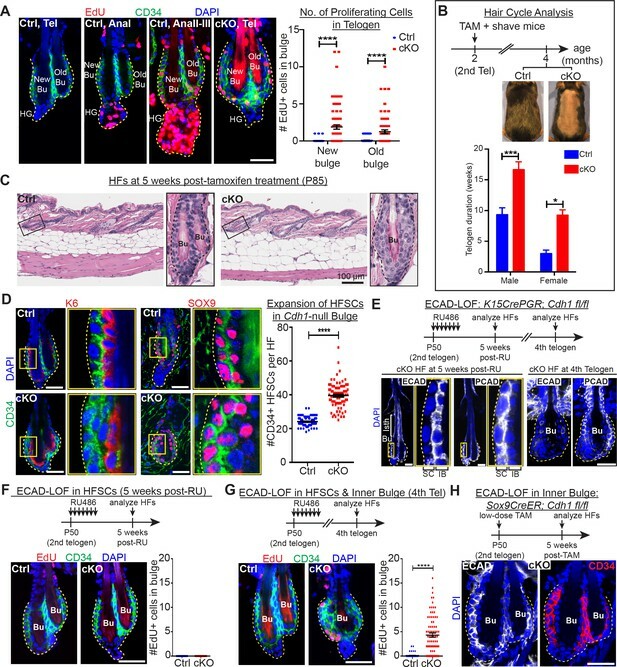 Our studies exposed a fascinating interplay between the terminally differentiated cells that provide the niche barrier, and its neighboring stem cells that fuel regenerative processes in hair cycling and wound repair. Through their ability to respond to their damaged niche, stem cells are able to alter their program of gene expression in a way that both primes the stem cells for proliferation and enables them to recruit immune cells. In turn, the immune cells bestow new keratinocyte growth factors and cytokines on the local niche microenvironment. The strong presence of Tregs may also enable stem cell niches to limit tissue damage that might otherwise be caused by massive inflammation. 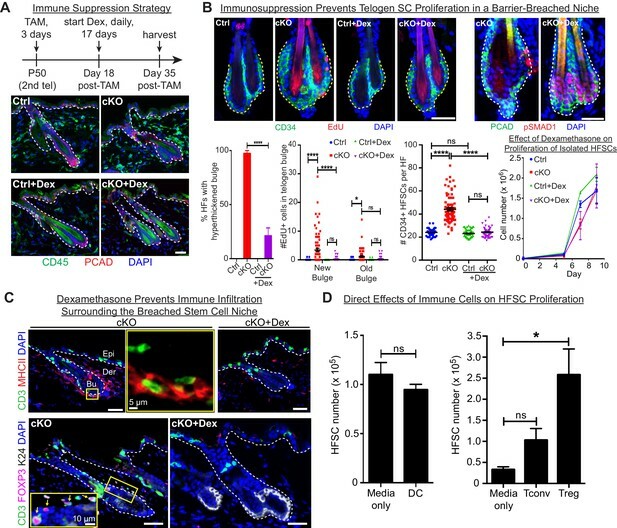 Our findings suggest that through their elevated cell cycle transcriptome, the primed stem cells within the damaged niche have a reduced threshold for proliferation and therefore selectively respond to recruited immune cells, even though normal homeostatic quiescent controls are still sufficient to keep other nearby cells (e.g. the hair germ) in check. This selective self-renewal behavior by stem cells sustains the immune response and also reinforces the damaged barrier with layers of cells whose intercellular junctions are intact. Our findings explain a number of pathological conditions involving perturbations in terminally differentiating cells that are manifested in healthy stem/progenitor cells. Cdh3null, Cdh1Flox, Rosa26lox-STOP-lox-YFP, Sox9-CreER, Krt15-CrePGR and Krt14-rtTA were described previously (Boussadia et al., 2002; Mao et al., 1999; Morris et al., 2004; Nguyen et al., 2006; Radice et al., 1997; Soeda et al., 2010). Sox9-CreER was activated by tamoxifen (Sigma) administered either by intraperitoneal (i.p.) injection (75 μg/g body weight in corn oil) once a day for 3 days or by single topical application (1.5 mg in ethanol) on hair coat of mice. Krt15-CrePGR was activated by mifepristone (RU486, TCI America) administered by i.p. injection (75 μg/g body weight in sesame oil) and topically (12 mg in ethanol) on shaved dorsal back of mice once a day for 7 days. Antibiotics treatment was performed by feeding mice with chow containing 0.025% trimethoprim and 0.1242% sulfamethoxazole; feeding with antibiotics water containing metronidazole (500 mg/L, Sigma), sulfamethoxazole (400 mg/L, Sigma), trimethoprim (100 mg/L, Sigma) and cephalexin (500 mg/L, Sigma) with Splenda sweetener to improve the taste of the water; and i.p. injection of vancomycin (0.75 mg, Sigma) and metronidazole (0.75 mg, Sigma) daily. Sox9CreER mice were treated with antibiotics starting one week post-tamoxifen until time of harvest. Immunosuppression was achieved by daily i.p. injections of dexamethasone at 1 mg/kg body weight. rtTA was activated by feeding mice with doxycycline (2 mg/kg) chow. To track hair cycles (Müller-Röver et al., 2001), full-length telogen hairs were trimmed with electric clippers to reveal dorsal skin. HF entry into anagen was determined by darkening of skin and reappearance of hair. Completion of anagen and re-entry into telogen were determined by appearance of full-length hairs and loss of pigmentation in skin. EdU (5-ethynyl-2’-deoxyuridine; Thermo Fisher, 25 μg/g body weight) was injected i.p. into mice twice a day before obtaining skin biopsies or lethal administration of CO2. All mice were maintained in a facility approved by The Association for Assessment and Accreditation of Laboratory Animal Care (AAALAC), and procedures were performed with protocols approved by Rockefeller University’s institutional animal care and use committee (IACUC) members. Cdh1-shRNA was obtained from the Broad Institute’s Mission TRC-1/2 mouse library and cloned into LV-pLKO-PGK-H2B-RFP vector (Moffat et al., 2006). Cdh1-shRNA sequence is CCGAGAGAGTTACCCTACATA. For myc-tagged PCAD overexpression, Cdh3 coding DNA sequence (CDS) containing myc tag sequence inserted after its pro-peptide sequence was synthesized and cloned into LV-TRE vector. To tag PCAD with myc at the C-terminal end, Cdh3 CDS was amplified with myc inserted before its STOP codon, then cloned into LV-TRE vector. LV production, concentration and ultrasound-guided transduction of mouse embryos in utero were performed as described previously (Beronja et al., 2010). To prepare sagittal skin sections for immunofluorescence microscopy, backskins were either freshly embedded and frozen in OCT, or pre-fixed in 4% paraformaldehyde (PFA) in PBS for 2 hr at 4°C then treated with 30% sucrose in PBS overnight at 4°C prior to embedding and freezing in OCT. Backskins were cryosectioned (12 μm) and sections from freshly embedded tissues were fixed for 10 min in 4% PFA. To prepare whole-mounts for immunofluorescence microscopy, subcutaneous fat was scraped from backskins, which were then incubated (dermis side down) on 2.5 U/ml dispase +20 mM EDTA for 2 hr at 37°C. Epidermis and HFs were separated from dermis, fixed in 4% PFA for 30 min at room temperature (RT) and permeabilized for 30 min in PBS + 0.5% Triton (PBST). Sections and whole-mounts were blocked for 1–2 hr at RT in 2% fish gelatin, 5% donkey serum, 1% BSA and 0.2% Triton in PBS. Primary antibody incubation was performed overnight at 4°C. Incubation with secondary antibodies conjugated to rhodamine red-X, Alexa 488, 546 or 647 was performed for 1–2 hr at RT. Mouse antibodies were incubated with M.O.M. block according to manufacturer’s directions (Vector Laboratories). Images were acquired with Zeiss Axio Observer Z1 equipped with ApoTome.2 through a 20x air objective or Zeiss LSM780 laser-scanning confocal microscope through a 40x water objective. To prepare sagittal skin sections for hematoxylin and eosin staining and immunohistochemistry, backskin was fixed in 4% PFA overnight at 4°C. Subsequent dehydration, paraffin embedding, sectioning and staining were performed by Histowiz Inc. Stained slides were scanned at 40x magnification using Aperio AT2 and visualized using Aperio Image Scope software. Modified Gram staining method has been described by (Becerra et al., 2016). Briefly, paraffin sections were applied, in the following order, with crystal violet, Gram iodine, Gram decolorizer and safranin (Remel). To dehydrate, sections were immersed in 95% ethanol, 100% ethanol, then treated with alcoholic saffron (American Master Tech Scientific Inc.) before further dehydration with 100% ethanol and citrus clearing solvent. Images were acquired with an Axioplan two upright microscope equipped with a Spot Insight QE color digital camera through 40x N.A. 1.3 oil and 63x N.A. 1.4 oil objectives. The following antibodies and dilutions were used for immunofluorescence: ECAD (rabbit, 1:1000, Cell Signaling, AB_2291471), PCAD (goat, 1:400, Sigma, AB_355581), CD34 (rat, 1:100, eBioscience, AB_466426), K6 (guinea pig, 1:2000, Fuchs lab), TCF4 (rabbit, 1:250, Cell Signaling, AB_2199816), SOX9 (rabbit, 1:1000, Fuchs lab), LHX2 (rabbit, 1:1000, Fuchs lab), p120-catenin (mouse, 1:1000, Zymed, AB_87178), β-catenin (mouse, 1:1000, BD, AB_397555), α-catenin (rabbit, 1:1000, Sigma, AB_476830), DSG3 (mouse, 1:500, MBL, AB_591238), plakoglobin (mouse, 1:500, BD, AB_397649), DP1 and 2 (mouse, 1:500, Millipore, AB_93346), myc-tag (rabbit, 1:300, Cell Signaling, AB_490778), CLDN1 (rabbit, 1:500, Abcam, AB_301644), ZO1 (rabbit, 1:250, Zymed, AB_2533938), CD45 (rat, 1:100, Biolegend, AB_312969), MHC II (rat, 1:100, Biolegend, AB_493727), F4/80 (rat, 1:100, Biolegend, AB_893504), CD3 (rat, 1:100, Biolegend, AB_1877072), FOXP3 (rat, 1:25, eBioscience, AB_467576), GFP (chicken, 1:2000, Abcam, AB_300798), pSMAD1 (rabbit, 1:100, Cell Signaling, AB_331671) and phospho-p65 (rabbit, 1:50, Cell Signaling, AB_330559). Phalloidin (1:100, Thermo Fisher) was used to detect F-actin. Nuclei were stained with 4’6’-diamidino-2-phenylindole (DAPI). EdU click-iT reaction was performed according to manufacturer’s directions (Thermo Fisher). β-catenin antibody (rabbit, 1:50, Cell Signaling, AB_11127855) was used for immunohistochemistry. To prepare single cell suspensions from telogen backskin, subcutaneous fat was scraped off with a scalpel and backskin was placed (dermis side down) on 0.25% trypsin (Gibco) for 35–45 min at 37°C. If inner bulge cells were to be isolated, backskin was placed on trypsin overnight at 4°C, then 1 hr at 37°C. To prepare single cell suspensions from anagen backskin, backskin was placed (dermis side down) on collagenase (Sigma) for 45 min at 37°C, dermal side was scraped off with a scalpel, and remaining epidermal side was transferred to trypsin for 20 min at 37°C. For both telogen and anagen backskins, trypsinized HF and epidermal cells were then scraped off gently and filtered with strainers (70 μm, followed by 40 μm). Dissociated cells were incubated with antibodies for 20 min at 4°C. The following antibodies were used: CD34-eFluor660 (1:100, eBioscience, AB_10596826), α6-PE (1:100, BD Bioscience, AB_396079), α6-PerCP-Cy5.5 (1:250, Biolegend, AB_2249260), β1-PE-Cy7 (1:400, eBioscience, AB_1234962), Sca1-PerCP-Cy5.5 (1:1000, eBioscience, AB_914372), Sca1-APC-Cy7 (1:1000, Biolegend, AB_10645327), CD200-PE (1:300, eBioscience, AB_1907362), CD45-biotin (1:200, eBioscience, AB_466446), CD31-biotin (1:200, eBioscience, AB_466423), CD117-biotin (1:200, eBioscience, AB_466569), CD140a-biotin (1:200, eBioscience, AB_466606) and Streptavidin-PE-Cy7 (1:500, eBioscience, AB_1011648). DAPI was used to exclude dead cells. Cell purification was performed on FACS Aria sorters equipped with Diva software (BD Bioscience). To analyze immune cells, backskin was minced in RPMI1640 media with L-glutamine (Gibco), 1 mM sodium pyruvate (Lonza), 10 mM acid-free HEPES (Gibco), 100 U/ml penicillin and streptomycin (Gibco). Liberase TL (Roche) was added to the media (25 g/ml) and backskin was digested for 120 min at 37°C. Digestion was stopped by addition of 20 ml of 0.5 M EDTA (Life Technologies) and 1 ml of 10% DNase (Sigma) solution. Dissociated cells were filtered with 70 μm strainer and stained with the following antibodies: Ly6c-FITC (1:100, Biolegend, AB_1186134), Ly6g-PE (1:200, Biolegend, AB_1186104), CD11c-PE-Cy7 (1:150, Biolegend, AB_493569), CD11b-PacBlue (1:300, Biolegend, AB_755985), MHCII-AF700 (1:300, Biolegend, AB_493727), CD45-AF750 (1:100, Biolegend, AB_2572115), CD64-PerCP-Cy5 (1:200, Biolegend, AB_2561962), TCRβ-PerCP-Cy5.5 (1:200, Biolegend, AB_1575176), γδTCR-APC (1:400, Biolegend, AB_1731813) and MerTK-PE (1:100, Biolegend, AB_2617035). Dead cells were excluded using LIVE/DEAD Fixable Blue Dead Cell Stain Kit (Molecular Probes) for UV excitation. FACS analyses were performed using LSRII FACS Analyzers and results were analyzed using FlowJo software. FACS-purified cell protein lysates were prepared using RIPA buffer containing protease inhibitor (Roche) and split equally for ECAD-ELISA and PCAD-ELISA. ECAD-ELISA was performed as per manufacturer’s protocol (R and D Systems). PCAD-ELISA was performed as per ECAD-ELISA protocol, but instead using PCAD monoclonal antibody (rat, Life Technologies, AB_2533006) as capture antibody, PCAD-biotin polyclonal antibody (goat, R and D Systems, AB_442232) as detection antibody, and recombinant mouse PCAD Fc chimera protein (R and D Systems) to calibrate standard curve for quantification. Gel electrophoresis of FACS-purified cell protein lysates was run on 4–12% NuPAGE Bis-Tris gradient gel (Thermo Fisher) and transferred to nitrocellulose membrane (Amersham). Membrane was blocked in TBS containing 2% bovine serum albumin (BSA) and 0.1% Tween-20 for 1 hr at RT, incubated with primary antibodies overnight at 4°C and with secondary antibodies conjugated to horseradish peroxidase (HRP) for 1 hr at RT. HRP activity was detected using enhanced chemiluminescence (ECL) substrate (Amersham). Quantification of bands was performed on ImageJ software. The following antibodies were used: ECAD (rabbit, 1:1000, Cell Signaling, AB_2291471), PCAD (goat, 1:1000, R and D Systems, AB_355581), p120 (mouse, 1:1000, Zymed, AB_87165), β-catenin (mouse, 1:1000, BD Biosciences, AB_11127855), α-catenin (rabbit, 1:4000, Sigma, AB_476881), claudin 1 (rabbit, 1:500, Abcam, AB_301644), ZO1 (rabbit, 1:500, Life Technologies, AB_2533938) and GAPDH (mouse, 1:4000, Abcam. AB_2107448). Following hybridization, samples were washed with probe wash buffer for 2 × 5 min and 2 × 30 min at 45°C, then washed with 5X SSCT (containing 0.1% Tween-20) for 3 × 5 min at RT. Samples were pre-amplified with amplification buffer for 30 min at RT before incubating with 30 pmol of fluorescently labeled hairpins overnight at RT. Samples were washed with 5X SSCT for 2 × 5 min, 2 × 30 min and 1 × 5 min at RT before fixation in 4% PFA for 5–15 min at RT and incubation with DAPI (2 μg/ml) overnight at 4°C. Samples were then washed with 0.3% PBST before being cleared for imaging. Probe hybridization buffer, probe wash buffer and probes were purchased from Molecular Technologies. For tissue clearing, backskins were transferred through increasing concentrations of ethanol diluted in distilled water and adjusted to pH9.0: 30% for 20 min, 50% for 20 min, and 70% for 20 min. Backskins were then incubated in 100% ethanol for 1 hr before transferring into ethyl cinnamate (Sigma) for clearing. Images were acquired with an inverted spinning-disk confocal system driven by iQ Live Cell Imaging software (Andor) using a 20x N.A. 0.75 air objective and 561 nm, 642 nm and UV laser lines, and analyzed using Imaris software. For spot analysis and quantification, sphere sizes were set to 2.5–3, and the estimated x-y diameter for spots was 0.6–1.5 μm. WT bulge RNA-seq data is from Lay et al. (2016). For all others, total RNA was extracted from FACS-purified cells by directly sorting cells into TrizolLS (Sigma) and processing with Direct-Zol RNA mini-prep kit (Zymo Research). RNA quality was determined using an Agilent 2100 Bioanalyzer and all samples sequenced had RNA integrity numbers > 8. mRNA library preparation using Illumina TrueSeq mRNA sample preparation kit and single-end sequencing on Illumina HiSeq 4000 were performed at Weill Cornell Medical College Genomic Core Facility (New York). Alignment of reads was done using STAR version 2.5.2a (Spliced Transcripts Alignment to a Reference) (Dobin et al., 2013) and transcripts were annotated using Gencode release M10 of the mouse genome. Differential gene expression analysis was performed with DESeq2 package version 1.18.0 (Love et al., 2014) using the gene count output from STAR read aligner. Gene ontology analysis was performed using DAVID (Huang et al., 2009a; Huang et al., 2009b). Skin biopsies were treated with dispase with EDTA, and epidermis was separated from dermis, in the same way as preparing tissue for whole-mount immunofluorescence. HFs in the epidermal fraction were then submerged in 1 mM Lucifer yellow (Thermo Fisher) in PBS for 3 hr at 37°C before fixation, mounting and imaging. HF stem cells were FACS purified and co-cultured with feeder fibroblasts in 300 μM Ca2+ as described previously (Nowak and Fuchs, 2009). For growth curve assays, equal numbers of Cdh1 cKO and control HF stem cells were cultured in triplicates in the absence or presence of 10 nM dexamethasone, and cell numbers were counted every other day from Days 5 to 9. For transwell migration assay, bone marrow-derived dendritic cells (BMDCs) or bone marrow-derived macrophages (BMDM) were obtained from femur and tibiae bone marrow of 8-week-old C57BL/6 mice and cultured in BMDC/macrophage medium (RPMI 1640 with L-glutamine, 10% heat-inactivated FBS, 10 mM HEPES, and 100 U/ml penicillin/streptomycin) at a density of 1 × 106 cells/ml with addition of 20 ng/ml recombinant murine GM-CSF (R and D Systems) and 10 ng/mL recombinant murine IL-4 (R and D Systems) for BMDC and 10 ng/ml recombinant murine M-CSF (R and D Systems) for BMDM derivation. The maturation of BMDCs or BMDM was induced by 100 ng/ml of LPS 24 hr prior to co-culture with HF stem cell medium. 5 × 105 mature WT or CCR2-nullBMDCs or BMDM were seeded onto upper chambers of 5 μm pore size in transwell plates with or without isotype control antibody or CCR8 blocking antibody (Biolegend, AB_2566246). WT or Cdh1-null HF stem cells were cultured in lower chambers and incubated for 3.5 hr at 37°C. BMDCs or BMDM that migrated into the bottom chamber were harvested and counted by flow cytometry, using CD45-APC (1:500, eBioscience, AB_469392) and DAPI to exclude dead cells. For co-culture proliferation assays, BMDCs were isolated in the same way as described above for transwell migration assay. Naive CD4+ T cells were isolated from the spleen of the 8-week-old C57BL/6 mice by Mojo CD4 T cell Negative Selection Kit (Biolegend), followed by in vitro activation on plates coated with 10 μg/ml anti-CD3 antibody (Thermo Fisher Scientific, AB_468847) and 2 μg/ml anti-CD28 antibody (Thermo Fisher Scientific, AB_468921), with or without 5 ng/ml TGF-β1 (R and D Systems), and incubation for 5 days to obtain regulatory T cells (Treg) and conventional T cells (Tconv) respectively. Tregs were then enriched by FACS using CD45-APC/Cy7 (1:200, Biolegend, AB_312981), CD4-PE/Cy7 (1:200, Biolegend, AB_312707), CD25-APC (1:200, Biolegend, AB_2280288), CD127-PE (1:200, Biolegend, AB_493509), and DAPI to exclude dead cells. Both Tconv and FACS-purified Tregs were cultured in T cell medium (RPMI-1640 with L-glutamine, 10% heat-inactivated FBS, 1 mM HEPES, 1 mM sodium pyruvate, 100 U/ml penicillin/streptomycin, and 55 μM 2-mercaptoethanol). To measure the effects of BMDCs, Tconv and Tregs on HF stem cell proliferation, 5000 Cdh1 cKO HF stem cells were seeded onto feeder fibroblast layers in lower chambers of transwell plates. 2 days later, HF stem cells were co-cultured with 2 × 105 LPS-treated BMDCs seeded in BMDC media, or 1 × 104 Tconv or FACS-isolated Tregs seeded in T cell media in upper chambers of 0.8 μm pore size for 4–5 days before their numbers were counted. For EM, backskins were fixed in 2% glutaraldehyde, 4% PFA, and 2 mM CaCl2 in 0.05 M sodium cacodylate buffer, pH7.2, at RT for >1 hr, post-fixed in 1% osmium tetroxide, and processed for Epon embedding. Ultrathin sections (60–65 nm) were counterstained with uranyl acetate and lead citrate. EM images were taken with a transmission electron microscope (Tecnai G2-12; FEI) equipped with a digital camera (Ultrascan, Gatan Inc.). Data were analyzed and statistics were performed using unpaired two-tailed Student’s t-test (when comparing two groups), one-way ANOVA with Tukey’s post-hoc test (when comparing >2 groups) or two-way ANOVA with Sidak test (for quantifications of EdU +HF stem cell numbers) in GraphPad Prism versions 6 and 7, with 0.05 level of confidence being accepted as a significant difference. The accession number for the RNA-seq data reported in this paper is NCBI GEO: GSE106767. The Journal of Immunology 179:5760–5767. American Journal of Respiratory Cell and Molecular Biology 57:162–173. The Journal of Immunology 174:5082–5091. The Journal of Immunology 184:6833–6842. British Journal of Dermatology 159:1077–1085. Journal of Investigative Dermatology 117:3–15. Methods in Molecular Biology 482:215–232. Current Opinion in Cell Biology 36:32–40. Journal of Investigative Dermatology Symposium Proceedings 16:S25–S27. The Journal of Cell Biology 139:1025–1032. Cell Host & Microbe 21:467–477. Cold Spring Harbor Perspectives in Biology 1:a002949. Nature Reviews Molecular Cell Biology 15:397–410. Trends in Cell Biology 28:560–573. The Journal of Experimental Medicine 213:2147–2166. Current Topics in Developmental Biology 118:21–44. Thank you for sending your article entitled "Stem cells repurpose proliferation to contain a breach in their niche barrier" for peer review at eLife. Your article has been evaluated by three peer reviewers, one of whom is a member of our Board of Reviewing Editors, and the evaluation has been overseen by Marianne Bronner as the Senior Editor. As you can see below, the reviewers had several concerns including the link between the loss of E-cadherin and the immune system, the mechanisms by which CCL ligands are elevated and function, and whether other transcriptional pathways are altered in the E-cadherin cKO mice. This manuscript addresses the role of cellular junctions on stem cell dynamics using the hair follicle (HF) as a model system. The authors show that disruptions in junctions through genetic loss of E-cadherin in hair follicle stem cells leads to activation of immune cells and proliferation. Interestingly, the stem cells do not differentiate but remain in the niche to reinstate the barrier. The manuscript contains several interesting points but the experiments that point to a role of the immune system are not specific and will likely require additional experiments that are beyond the shortened revision time for eLife. 1) Figure 4. The graph of Tregs is not labelled on the figure or the legend. What is the difference between the open circles and the triangles? 2) Figure 5. Which cKO mouse is used for the expression analysis? The legend and/or figure should reflect the genetic model used for this experiment. 3) The difference between macrophage vs. DC cell numbers in the cKO is confusing. Since CCR2 recruits macrophages and DCs, the upregulation of these genes should elevate macrophages in the cKO mice. These seemingly disparate results should be clarified in the manuscript. 4) The experiments using dexamethasone (Dex) are quite non-specific for inhibiting immune cells. It is known that Dex can alter DP cells (Kwack et al., 2017) and other cell types in the skin. The authors do show that direct interaction of Tregs and bulge cells induces their proliferation, but this was shown recently (Ali et al., 2017) using careful genetic models of cellular depletion. The authors should perform specific experiments that implicate the immune cells and/or specific immune cells. 5) The authors do not perform functional analysis of BMP/FGF signaling in proliferation in their model. 6) Does the proliferation that is induced in the bulge regenerate the barrier function in the cKO mice? 7) In the figure legends the authors mention n=4 mice. Is that 4 mice per genotype or 2 mice per genotype? In the manuscript Lay et al. discover an important interplay between HFSC and immune cells following breaches in the inner bulge niche. Using several strategies, they demonstrate that E-cadherin is important for maintaining adherens junctions, tight junctions, and integrity of the niche, but does not affect niche cell numbers in the bulge. Ablation of Cdh1 specifically in bulge stem cells did not cause the stem cell proliferation phenotype indicating that niche signaling is responsible for stem cell proliferation and expansion of bulge layers in Cdh1 KO mice. Treating Cdh1 KO mice with various antibiotics did not prevent stem cell proliferation, demonstrating that bacterial infiltration is not responsible for stem cell proliferation following niche breach. Dendritic cells (DCs) and αβ T cells, but not macrophages or γδTCR, showed marked and significant recruitment to breached stem cell niches. Immune cell recruitment was mediated by an upregulation of chemokines in Cdh1 KO HFSC and WT HFSC near Cdh1 KO inner bulge niche, revealed with RNA-Seq using FACS sorted populations and validated with in vitro migration assays. Ccl1 and Ccl2, established chemokines for DCs, were the top two most highly upregulated genes in the stem cell cohort. Increases in Ccl1 and Ccl2 occurred in Cdh1 KO HFSC in the presence of antibiotics, demonstrating again that the breached niche response is independent of bacterial infiltration. Furthermore, DC recruitment by HFSC is dependent on DC CCR2 expression, the receptor to Ccl2. Lastly, immunosuppression prevented the HF hyper thickened bulge phenotype and HFSC proliferation, revealing a role for immune cell infiltration in breached niche protection independent of bacterial infiltration. The experiments are controlled well, observations validated using several strategies, and conclusions strongly supported by the data. The manuscript will be of interest to a general audience and is highly novel. I have a few remaining questions. 1) Does Ccl1 and Ccl2 expression increase in WT HSFC surrounding Cdh1 KO inner bulge in antibiotic conditions? 2) Why is an increase in HFSC Ccl1 important? Ccl1 interacts with CCR8, expressed by DCs, T cells and monocytes. Were in vitro migration assays using CCR8 KO DCs or T cells performed? Does Ccl1 have a role in breached niche protection? 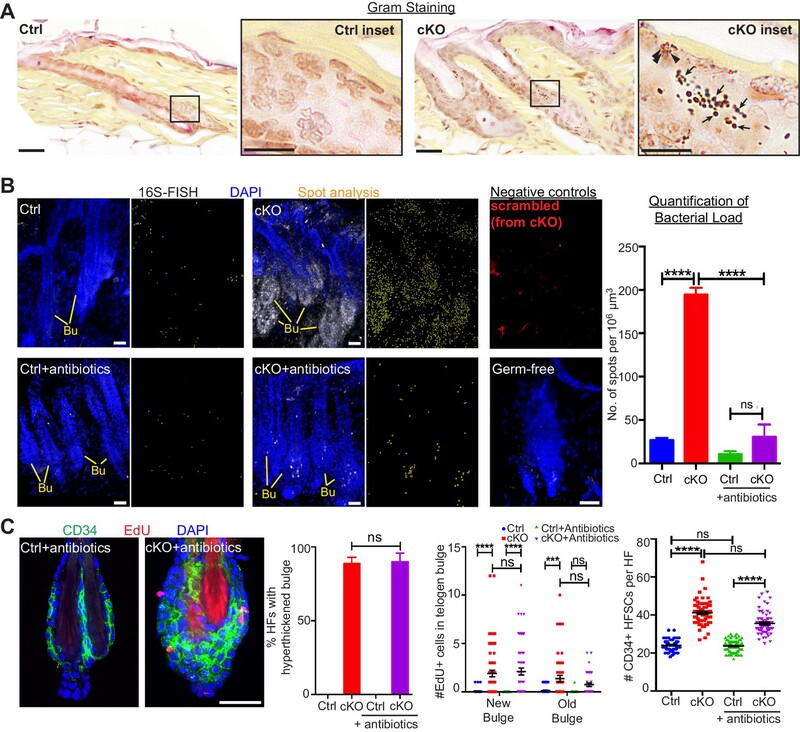 In this manuscript, Lay and colleagues studied the effect of E-cadherin loss in hair follicle stem cells and their niche. Using sophisticated mouse models to delete E-cadherin in the stem cells and niche either collectively or separately, they have made fascinating observations that hair follicle stem cells can sense the barrier breach and engage in a hyper-proliferative state without triggering hair follicle growth. They have further delineated the role of bacterial infiltration and immune cell accumulation followed by the barrier breach and demonstrated that only immune cell accumulation but not bacterial infiltration leads to abnormal stem cell division. The data are of very high quality and convincing. We appreciate the reviewer’s comments and also recognized in reading some of their remarks that there were experiments/data presented that needed clarification. In fact, our studies underscoring a role for the immune system are specific for the particular question we try to address, as we explain in response to several of the reviewer’s concerns raised below. We thank the reviewer for pointing out this inadvertent omission. The open-circle dataset included an outlier that was consistent with our findings (an increase in Tregs upon barrier breach) but made the difference statistically insignificant. The triangle dataset excluded the outlier, in which case the difference between cKO and control was statistically significant. Since the outlier is part of the experimental data, and yet our conclusions are clear, we felt this was the fairest way to present these data. We have now indicated this in the legend for Figure 4D-F.
We thank the reviewer for pointing out this poorly explained point, which we now clarify in the legend/Materials and methods. In all cases, our “controls” are always matched littermate heterozygous animals. For Figure 5A, we use low dose Tam and SOX9CreER during mid-telogen to analyze the difference between the inner bulge cells lacking Cdh1 and their heterozygous WT counterparts. For Figure 5B and C, we use high dose Tam and SOX9CreER during mid-telogen and determine the HFSC signature in HFs whose bulge is either WT (heterozygous) or mutant for Cdh1. For Figure 5D, top Venn Diagram, we use low dose tamoxifen with SOX9CreER and compare how WT HFSCs differ in gene expression when they experience a WT versus a mutant niche. Principle component analyses in Figure 5E reveal that the signature is very different from simply WT HFSCs during their natural phase of proliferation (Anagen II/III). For Venn Diagram in Figure 5D (bottom), we show that the inner bulge and HFSCs respond very differently to the breached barrier. In Figure 5F, we are taking the top genes from the inner bulge “immune crosstalk” signature (cKO inner bulge signature vs. control inner bulge) and then comparing their expression levels to the HFSC expression levels. From these data, it is clear that the levels of even these genes are higher in the HFSCs than the inner bulge niche. In Figure 5G, we take the top genes from the HFSC “immune crosstalk” signature (Cdh1-null HFSCs vs. control HFSCs) and then compare their levels to those of the inner bulge whose Cdh1 gene is ablated. Again, the gene expression levels are higher, substantially so, over the inner bulge expression levels. In Figure 5G, for comparative purposes, we also add an analysis of how these top HFSC “immune crosstalk” genes differ when the HFSCs are either Cdh1 null (red bars) or WT (green bars). The importance of performing the experiments in this way was to maintain the same genetic background throughout and analyze every possible combination. From the collective analyses, we could clearly demonstrate that the “immune crosstalk” signature was seen irrespective of whether the HFSCs were WT or Cdh1 null, but that it was in all cases dependent upon the status of the inner bulge niche (either breached or WT). We have now revised the Figure 5 legend to indicate the mouse models used for the various RNA-seq analyses. I presume the reviewer meant to say “...since CCL2 recruits macrophages and DCs...”. Since we discovered CCL2 specifically expressed by HFSCs within a breached barrier niche, indeed, we could have expected to see either an increase in macrophages or DCs or both. In contrast to many studies that have been performed on the skin (such as the Cheng-Ming Chuong study reporting elevated CCL2 (location unknown) and macrophages in skin following hair plucking, which induces mechanical damage and removes the BMP6/FGF18-expressing niche cells), we performed a complete immune cell analyses, and carefully quantified by FACS to identify which of the immune cell types infiltrate the skin soon after a breach of the HFSC niche. We also then used immunofluorescence to localize which of these immune cells were specifically localized to the HFSCs, which in our case was the direct source of CCL2. In so doing, it was clear that the main immune cell differences in our breached barrier model were in DCs and Tregs. Although macrophages and DCs share many markers in common, we define DCs by CD45+CD11b+ CD64-Mertk-Ly6C-Ly6G-MHCII+CD11c+ cells, and CD45+CD11b+MHCII+CD64+MertK+ cells as Macrophages. We have now added these distinguishing markers to our FACS plot analyses so that readers can see the full regalia of our analyses. There are several studies that report that cytokine milieu can skew the populations of Macs vs. DCs, and we cite these papers, as they have relevance to our study. Additionally, we added a sentence to make sure that we don’t give the reader the misimpression that macrophages are irrelevant, since they are certainly present in normal skin, and we did see some signs of macrophage increases in the breached niche (data in Figure 4—figure supplement 1E and F). It is just that in our experiments, the levels of macrophage increases were quite variable and analyses indicated no significant differences (see Figure 5D)(note that we did analyze multiple mice – 6 by FACS and more by immunofluorescence – and this difference remained variable, whereas DC increases were significant). We’ve now expanded our FACS profiles in Figure 4—figure supplement 1E and adjusted the text (subsection “Immune cells are recruited to the breached niche independently of bacteria”, fourth paragraph) to point out that macrophages were seen as we show in Figure 4—figure supplement 1 immunofluorescence images, but the numbers were not sufficiently consistent to be statistically significant. We thank the reviewer for their comments. 1) Do the infiltrating immune cells cause the transcriptome changes that we see in stem cells that experience a breached niche or is this rooted in the breached niche? Total immune suppression was needed to address this question, and we show that the aberrant cell cycle and inflammatory transcriptome of the telogen-phase stem cells occurs independently of the immune cell infiltration (Figure 6E-G). Since total immune ablation did not impact the HFSC transcriptome, specific immune ablation experiments were not relevant in addressing this point. 2) Is the proliferation that we see in telogen phase stem cells that experience a barrier breach due to the immune infiltration or the barrier breach? Total immune suppression was necessary to demonstrate this and we show that the immune cell infiltration was necessary (Figure 6B). The reviewer raises an important point, namely that dexamethasone not only suppresses the immune system, but can affect other cell types. Regarding the Experimental Dermatology paper that the reviewer refers to, and which picks up on an earlier Paus paper, it has been reported that Dex can affect full anagen-phase mouse follicles, where it can lead to early entry into catagen. In our case, however, we focus on mid-telogen, where no adverse effects of Dex have been previously described, and critically for our study here, we do not see overt changes in the effects of Dex on our control WT mice. Of equal importance, we always use matched littermate controls in our experiments, and our focus is on differences that are exclusive to the skin whose niche barrier has been breached. In this context, since both immune infiltration and aberrant telogen phase proliferation were eliminated by Dex, it was important to show that Dex alone does not impair HFSC proliferation. We did this experiment by culturing HFSCs under conditions where they proliferate and demonstrating that Dex does not affect proliferation status of HFSCs (Figure 6B). We explain this rationale more clearly in the text, and have added the Experimental Dermatology reference suggested by this reviewer. We also weighed the options to use genetic targeting of specific immune cell populations versus coculturing of specific types of immune cells with HF stem cells. The reviewer highlights the Ali Cell paper, demonstrating that resident Tregs are present in normal skin and that they have a positive effect on normal anagen. However, our question was whether there is direct crosstalk between Tregs and stem cells and/or between DCs and stem cells, and since Tregs are known to impact other cell types, including other immune cells and since they could be mediating their effects indirectly through action on other skin populations, we felt this strategy may not be optimal. Rather, to address whether the immune component is directly involved in cross-talk with stem cells, it is essential to examine the effects of specific immune cells on HFSCs and the effects of the HFSCs on the specific immune cells in isolation. In this case, because DCs and Tregs are the major immune cells that swarm the breached niche, we purified and prepared DCs and Tregs, and then performed co-culture assays with HFSCs, purified from the breached niche. The outcome of these data are clear: DCs can be recruited by HFSCs in a transwell migration assay, but only if they have the CCR2 receptor to sense CCL2 (Figure 5I). By contrast, Tregs affect HFSC proliferation (Figure 6D). While our findings on Tregs are consistent with those of Ali et al., our experiments show for the first time that the effects are direct (conditionally knocking out Notch ligand in Tregs in vivo similarly did not address whether the effect the authors saw was directly between Tregs and HFSCs). Since the co-culture experiments were definitive, and since they were the best way to achieve our goal here, i.e. to demonstrate direct cross-talk between HFSCs and immune cells, we did not pursue immune cell ablation studies. However, it is important to consider that the proposed experiments cannot simply be added as supplementary data providing ‘supportive evidence’ – they are neither trivial nor cheap. We already have 4 genetically targeted alleles (Sox9CreER, R26YFP, Cdh1fl/fl) and DCs would add at least another two alleles, while Tregs would add another allele. We do discuss the Ali et al. Cell paper and emphasize better in the text the virtues of the co-culture experiments versus the immune ablation experiments. As a final note, we also make certain to point out that, in skin whose HF barrier is breached, there is an even more robust and also highly niche-focused elevation in Tregs that is not seen in normal skin. We have now revised the Results section entitled “Stem cell proliferation and bulge hyper-thickening arise from immune cell stimulation” to clarify our rationale for using Dex rather than ablating specific immune cells to address whether the transcriptomic changes and altered proliferation in HFSCs were rooted in the breached niche or in immune cell infiltration into the breached niche. We have also included the Experimental Dermatology reference, making it clear to the reader that we recognize the potential caveats of Dex but that these are not applicable to our study which focuses on a HF stage that is not known to be affected by Dex. We and others have previously performed functional analyses underscoring the importance of BMP/FGF signaling for stem cell quiescence in the hair follicle, and the importance of inner bulge BMP expression in raising the threshold for stem cell proliferation (Hsu et al., 2011). Figure 6—figure supplement 2A shows the FPKM and qPCR analyses showing that BMP and FGF18 levels are not significantly changed when the inner bulge niche is present, but lacks Cdh1. We also show that upon elimination of the immune cell infiltration, pSMAD1, downstream of BMP-signaling still occurs in the HFSCs surrounding a Cdh1 null niche (Figure 6B). This verifies that the inner bulge niche is still capable of not only expressing Bmp genes but also in impacting BMP-signaling in the HFSCs. This differs distinctly from hair plucking, where the inner bulge niche is absent and telogen-phase BMP-signaling is lost (Hsu et al., 2011). That said, the reviewer raises a good point, and we have now added relative expression of the BMP targets Id1, Id2, Nfatc1 and Foxc1 in HFSCs and inner bulge cells as revealed by our RNA-seq analysis in Figure 6—figure supplement 2A. Despite the reduction in Id1 and Id2 in Cdh1-null HFSCs, which is not surprising given their proliferative nature, these cells still maintained expression of the critical HFSC quiescence transcription factors Nfatc1 and Foxc1. Finally, we show that Id1 and Id2 are restored in the dexamethasone-treated condition, concomitant with BMP/pSMAD1 signaling, further substantiating that the telogen signals imposed by the inner bulge niche are still operative in the Cdh1 null niche (Figures 6B and Figure 6—figure supplement 2A). The reviewer raises an excellent question. Our model is a genetic one, and hence the stem cell’s efforts to patch the barrier are futile. In this regard, it is intriguing that in genetic mutations that affect the suprabasal epidermis, e.g. K10/K1 mutations, for instance, so too is the effort futile, although there the basal progenitors hyper-proliferate too (Fuchs et al., 1992). There is also a fascinating difference between the two stem cell responses: in epidermolytic hyperkeratosis patients/mice (K1/K10 mutations), the proliferative epidermal stem cells generate excessive layers of differentiating cells. In the HF, the proliferative stem cells generate excess stem cell layers but do not add to the defective inner bulge layers. There is an interesting reason for this: in contrast to the epidermis, whose basal progenitors give rise directly to the terminal differentiating cells, in the HF, the stem cells don’t directly differentiate into inner bulge cells; rather the inner bulge layer forms at the end of the hair cycle (Hsu et al., 2011). We have now discussed this intriguing point in the Discussion section entitled “Talking back: immune cell participation in containing the barrier breach”. As a final note, we planned to perform Lucifer yellow experiments on WT skin after its hairs have been plucked. In this situation, we expected to create a barrier breach under conditions when the HFSCs are only one layer. However, we encountered difficulties in handling plucked HFs and accurately assaying for Lucifer yellow penetration because of their highly distorted morphology upon plucking. Given the caveat introduced by this distortion, the comparison is not a fair one against Cdh1-null HFs, whose morphology, besides their hyper-thickened bulge and altered actin network, is still intact. 4 mice per genotype – we have revised all figure legends to clarify this point. In reading this comment as well as the reviewer’s summary statement above, “Increases in Ccl1 and Ccl2 occurred in Cdh1 KO HFSC in the presence of antibiotics, demonstrating again that the breached niche response is independent of bacterial infiltration,” we realized that we have presented our data in a way that is confusing. In fact, Ccl1 and Ccl2 are increased both in the WT and in Cdh1 KO HFSCs that surround a breached niche. These data are shown in Figure 5G. Antibiotics do not abrogate this increase, as we show for the high tamoxifen situation (Figure 5H). The confusion arose from the way we presented the data in Figure 5H. The key point is not the comparison between control HFSCs + antibiotics and Cdh1 null HFSCs + antibiotics (i.e. purple vs. orange bars), but rather Cdh1 null HFSCs (in a breached niche) whose skins were either treated (orange bars) or not (red bars) with antibiotics. The conclusion is that in the presence of antibiotics under conditions that prevent the bacterial invasion, the stem cells still express Ccl1 and Ccl2 when they experience an inner niche defect and not when they don’t. We now clarify that (1) the Cdh1-null HFSCs in Figure 5H were in a mutant niche and (2) reorganized the bars in a way that guides the reader, i.e. red and orange, followed by blue and purple. Although we cannot combine the Ccl1 and Ccl2 data into Figure 5G and H, as one is transcriptome and the other qPCR, we have made it clear to readers that the two sets of data complement each other. The readers will then be able to readily see that irrespective of whether mutant or wild-type, HFSCs that experience a mutant niche specifically upregulate Ccl1 and Ccl2, and that barring bacterial infiltration does not abrogate their expression. We are grateful to the reviewer for their careful analyses of our data and are thankful for the comment. We have now revised Figure 5H and its accompanying legend to show that Ccl1 and Ccl2 are still highly upregulated independent of antibiotics (and hence bacterial infiltration) as there is no statistically significant difference between the red (Cdh1-null HFSCs) and red candy-striped (Cdh1-null HFSCs with antibiotics) bars. 2) Why is an increase in HFSC Ccl1 important? Ccl1 interacts with CCR8, expressed by DCs, T cells and monocytes. Were in vitro migration assays using CCR8 KO DCs or T cells performed? The reviewer raises an interesting point. The reason why we pursued only CCL2 and not also CCL1 is because the CCR8 mice are not commercially available in contrast to CCL2 null mice. When we performed the tests on DC migrations in WT versus CCR2 mutant backgrounds, we saw that the migratory effect was diminished, underscoring CCR2-CCL2’s role. That said, CCL1-CCR8 interactions could still play a role as the migration was compromised but not completely blocked. We have now performed in vitro migration assays using CCR8 blocking antibody. We found that blocking the CCL1-CCR8 axis had a less profound effect on DC and macrophage migration (new Figure 5J). However, treating CCR2-KO DCs and macrophages with CCR8 blocking antibody to block both CCL2-CCR2 and CCL1-CCR8 signaling had an additive effect, dampening DC and macrophage migration more than blocking either pathway alone (updated Figure 5I). As the reviewer suggested, we have also performed migration assay for Tregs. However, we did not observe a significant difference in Treg migration induced by Cdh1 cKO HFSCs compared to WT HFSCs. Therefore, we did not perform additional treatment of Tregs with CCR8 blocking antibody. Note that we contemplated but do not think it is a valid approach to try performing CCL1 and CCL2 shRNA knockdown experiments on our purified HFSCs, since we are isolating HFSCs fresh from a breached niche, and the time for us to carry out and confirm efficient shRNA knockdown could pose a new caveat. We thank Fuchs’ lab colleagues F Garcia Quiroz for input on PCAD overexpression construct design and barrier assays; N Gomez for bioinformatics expertise; I Matos, V F Fiore, S Baksh and M Tierney for discussions; A Sendoel, S Ellis, M Laurin and F Garcia Quiroz for critical reading of the manuscript; J Levorse for in utero lentiviral injections; L Polak, M Sribour and L Hidalgo for mouse husbandry and procedures; E Wong and S Mereby for genotyping assistance. We thank D Mucida (Rockefeller) for germ-free mice and H Choi (Caltech) for 16S probes and reagents. We thank Rockefeller’s facilities: Comparative Bioscience Center for care of mice in accordance with National Institutes of Health (NIH) guidelines; Flow Cytometry Resource Center for FACS; Bioimaging Resource Center for confocal and light microscopy. We also thank Weill Cornell Medical College Genomics Resources Core Facility for performing RNA-seq. EF is an investigator of the Howard Hughes Medical Institute. KL is a Fellow of the Singapore Agency for Science, Technology and Research (A*STAR). SY and SBL are NIH Ruth L Kirschstein Predoctoral Fellows. SG-C is a fellow of the Human Frontier Science Program. YM is a Jane Coffin Child Fellow. SN is a Dale Frye Damon Runyon Cancer Research Foundation Fellow (DRG-2183–14). This study was supported by NIH grants R01-AR27883 and R01-AR050452 (EF) and L’Oreal USA For Women in Science (SN). Animal experimentation: All mice were maintained in a facility approved by The Association for Assessment and Accreditation of Laboratory Animal Care (AAALAC), and procedures were performed with protocols approved by Rockefeller University's institutional animal care and use committee (IACUC) members. © 2018, Lay et al.